Australian hotel and resorts are paying extra attention to family travel and we couldn’t be happier. Incentives we love include; gifts at check-in, kids stay and eat free promises, healthy kids menus, in-room play corners, toy borrow boxes and kids club programs. Families have more accommodation choices than ever before with the rise of family suites, apartment resorts and discounted interconnecting rooms. 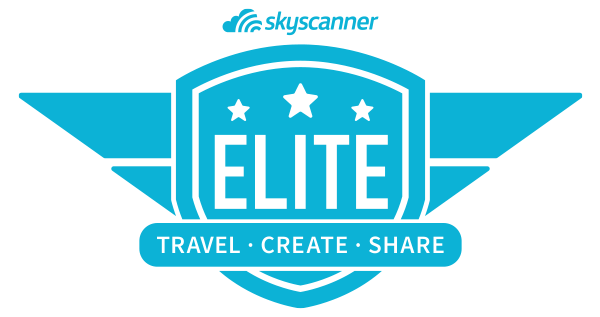 Here is a state by state round up of the the best family friendly accommodation in Australia. Wow Canberra! The nation’s capital has an excellent selection of family accommodation. East Hotel tops the list of best family accommodation in Canberra and quiet possibly the best in Australia for it’s convenient location, great facilities, spacious apartments, funky furnishings but most of all it’s thoughtful touches. 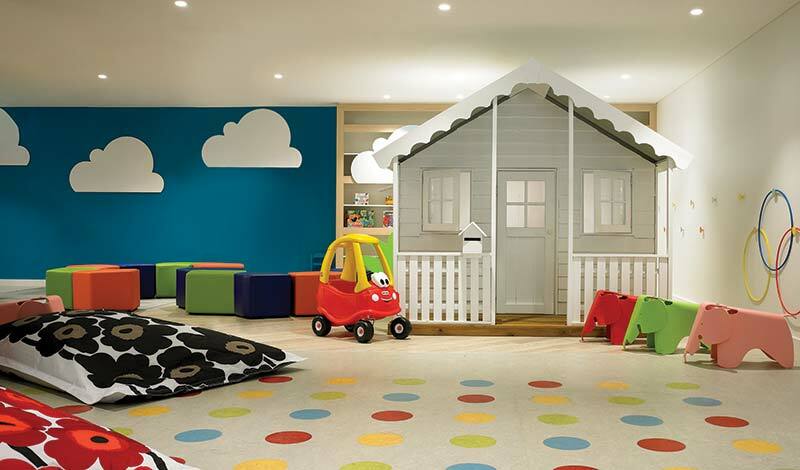 Kids are welcomed with their own play corner and personalised welcome message, age-appropriate toys to play and a giant roll of butcher’s paper to crayon. 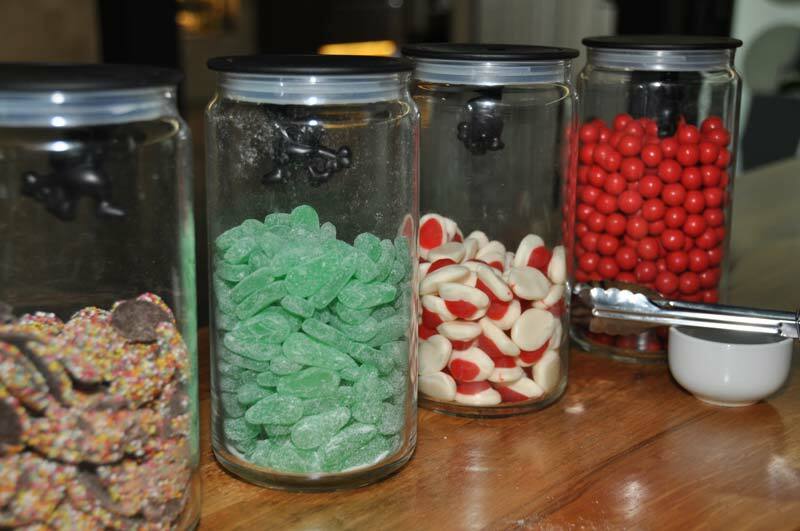 If for no other reason, stay at this new hotel for the free lollies in the lobby. 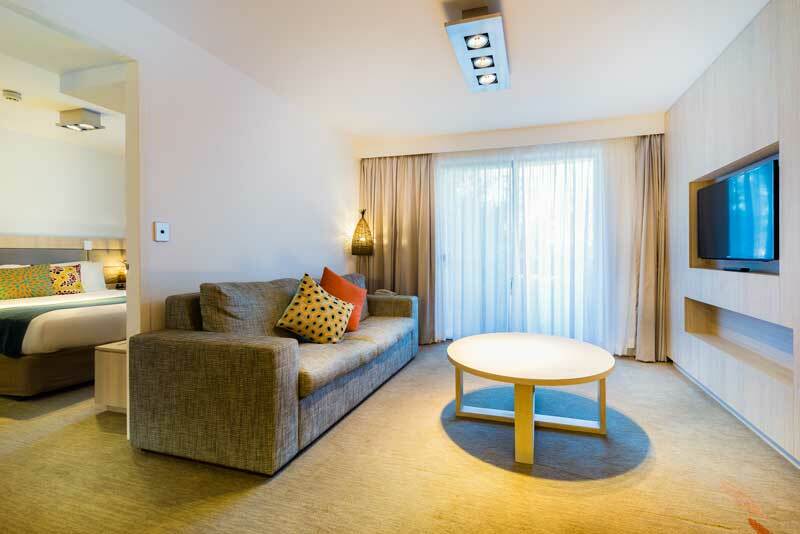 GREAT FOR FAMILIES that want a Canberra city break in contemporary, comfortable apartment accommodation. Stay in the Kids Cubby, a floorplan set up especially for families. The Two Bedroom Apartment has an interconnecting door to a separate room fitted out with bunk beds, kids play table dining table, bean bags and Xbox 360. Xbox’s are available for loan if staying in a standard room. Each apartment has a fully equipped gourmet kitchen, laundry, balcony, TV and Nespresso Machine. It’s all about the kids at the 4 star Sea World Resort. When the kids are content, parents are happy to pay a premium on resort cocktails, especially when the kids are having fun at the SponeBob Squarepants themed kids club. Close to the action, Main Beach, Australia Fair Shopping Centre, Surfers Paradise and major theme parks a short drive away. 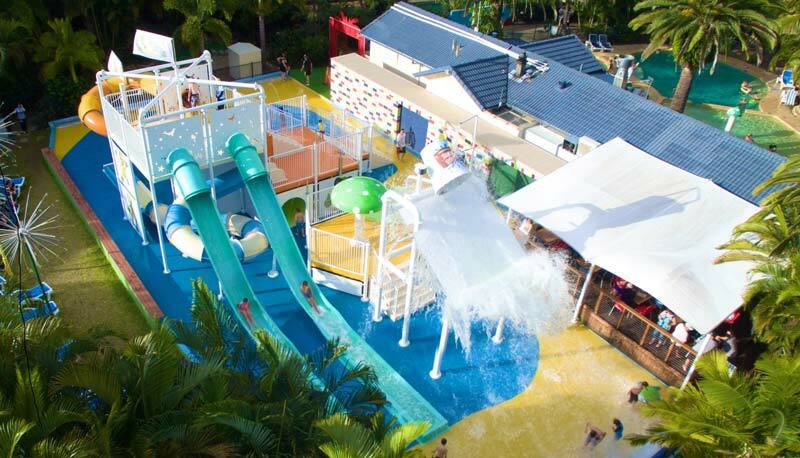 GREAT FOR FAMILES that want to embrace the Gold Coast theme park holiday with the comforts of a resort and kids club. 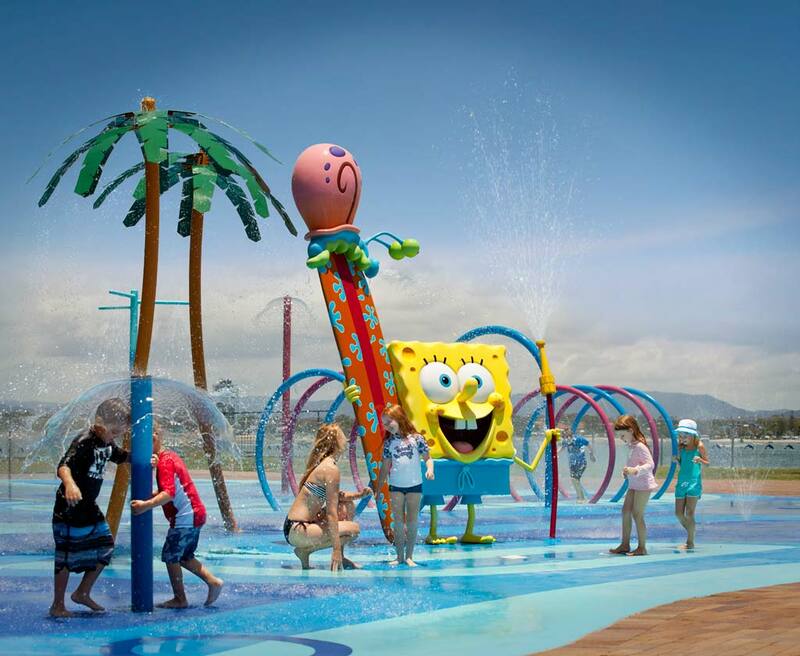 Meet your favourite Nikelodeon character, watch a VIP dolphin presentation before the park opens, splash at exclusive Castaway Kids and SpongeBob Splash Zone. Stay in Family Suites with interconnecting rooms. 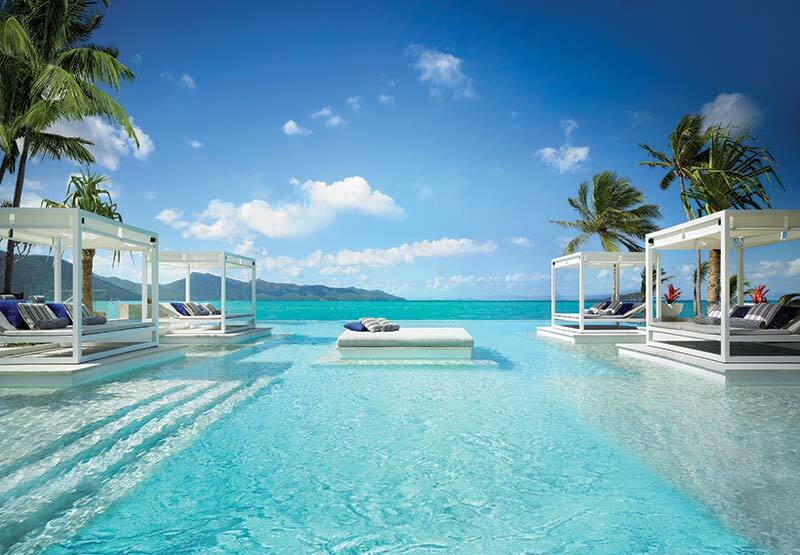 The rebranded and refurbished, One&Only Hayman Island resort offers 5 star luxury for kids. KidsOnly welcomes children aged 4-11 years on supervised activities including treasure hunts, fish feeding, baking competitions, arts and crafts. Best of all it’s free. Providing parents kid-free time to relax and enjoy the luxurious resort. 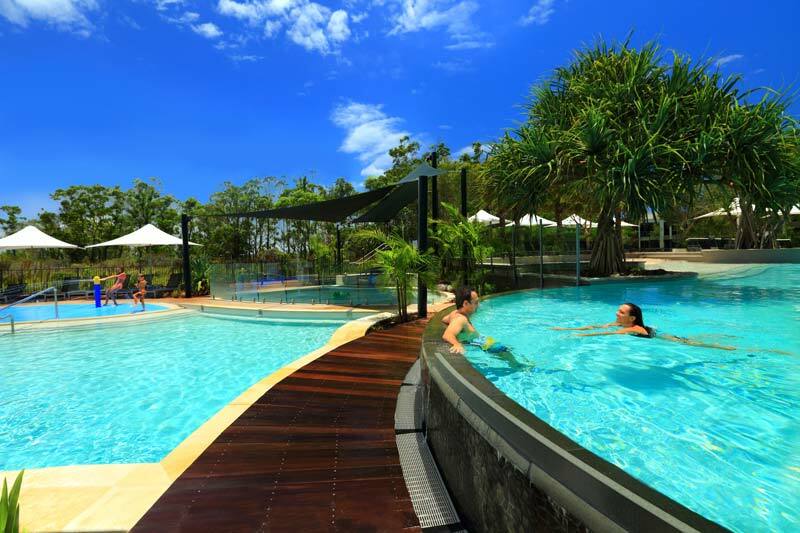 GREAT FOR FAMILIES who want the ultimate Whitsunday resort holiday. Stay in a Hayman Family room, offering two rooms connected by a shared foyer, beautifully refurbished in neutral tones, and features all the mod cons and boats open plan dressing room and large private balcony. Day trip to Whitehaven Beach, go on a helicopter ride or charter a private boat. Free activities include, windsurfing, catmaran sailing or paddle skiing. For parents there is gym, driving range, basketball courts, tennis courts, spa indulgence and beauty salon. The award winning RACV Noosa Resort, set amongst bushlands, five minutes drive or free shuttle ride from the hustle bustle of Hastings Street and the beautiful Noosa Main Beach. Offering affordable 5 star luxury in spacious, modern apartments. There’s also a Kids Club during school holidays, providing some kid-free for parents to enjoy a meal out in Noosa. GREAT FOR FAMILIES that want a relaxed Noosa family resort holiday without compromising on space and luxury. 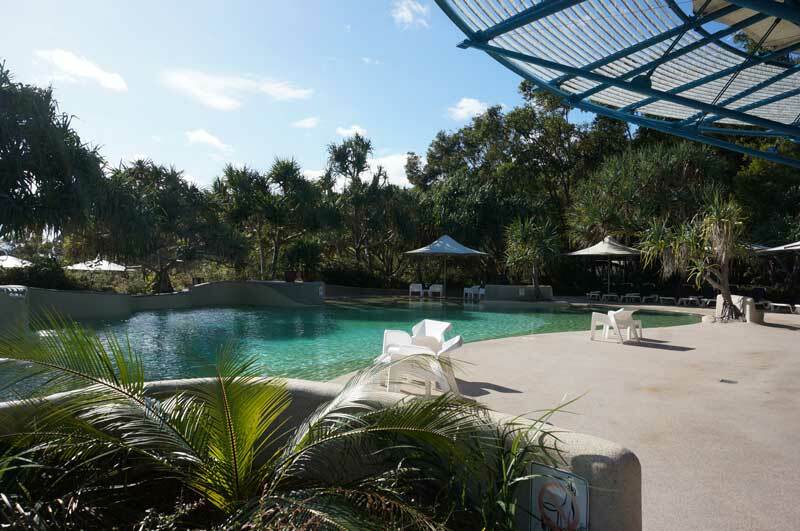 Swim all day in the two heated pools with waterslides, wading pool and spa, play at the splash park and playgrounds, have hit on the tennis courts, go for a bike ride and explore Noosa via shuttle bus. For parents, indulge in massages or cocktails poolside. Stay in stylishly appointed 1-3 bedroom apartments with all the modern amenities including DVD library for the kids. 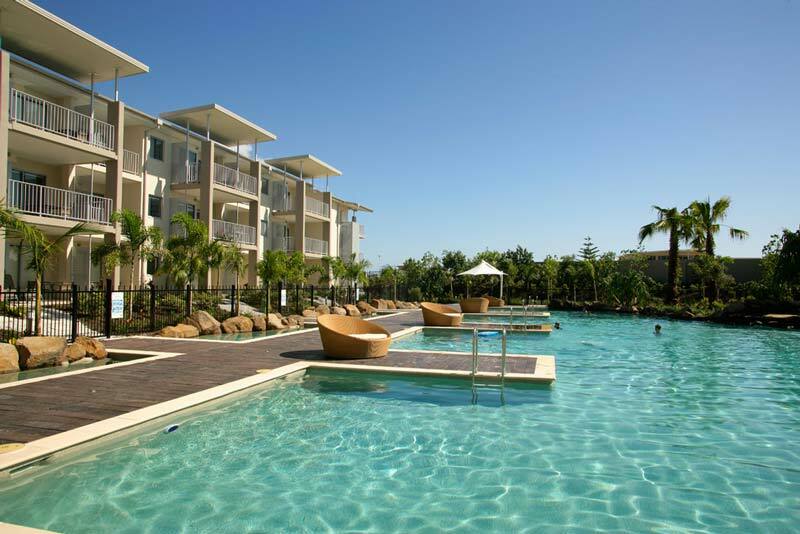 Whitsunday Apartments Hamilton Island offers value for money in refurbished, spacious 1 bedroom serviced apartments. All guests can make use of the Hamilton Island resort facilities including the Clownfish Kids Club that welcomes kids from 6 weeks – 13 years. The monolithic apartment structure seems out of place in paradise, however each ocean-facing apartment offers spectacular views over the turquoise waters of Catseye Beach. Sharing the same enviable views is the Reef View Hotel next door, only at a fraction of the price. Roomy apartments, comfortably furnished. Great views. 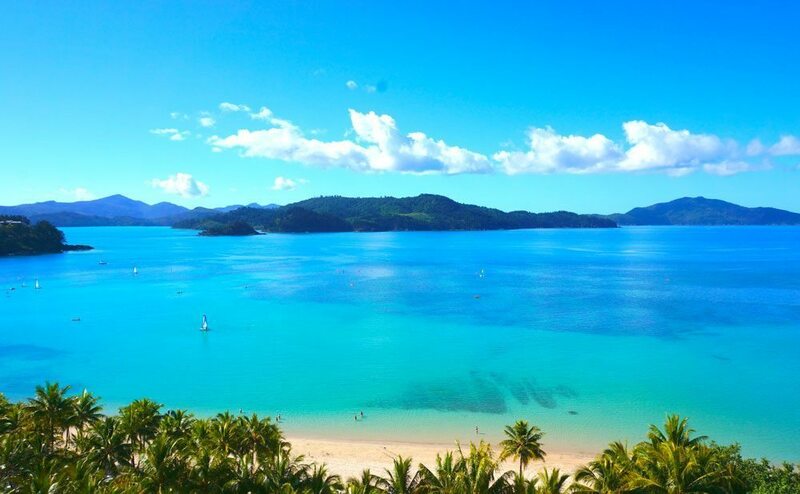 Day trip to Whitehaven Beach with ease, swim in the lagoon pool and spa, meet the animals at WILD LIFE park, have a hit of tennis, hire watersports from Cateye Beach, sail the calm waters of Hamilton Island, go quad bike riding or for parents indulge in the spa or tee off at the champion golf course. 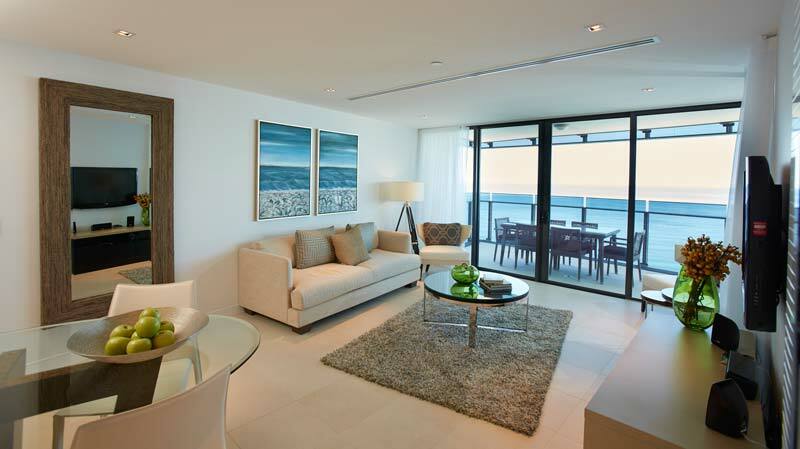 Stay in spacious Deluxe Coral View Apartments with unobstructed views of the Coral Sea. Kingfisher Bay Resort, located on World Heritage-listed Fraser Island and within easy reach of the powder white shores of beautiful Lake McKenzie. Resort facilities include award winning ‘Junior Eco-Rangers’ program. Kids can learn about the island’s surroundings and the culture of the Butchulla people, indigenous of Fraser Island. 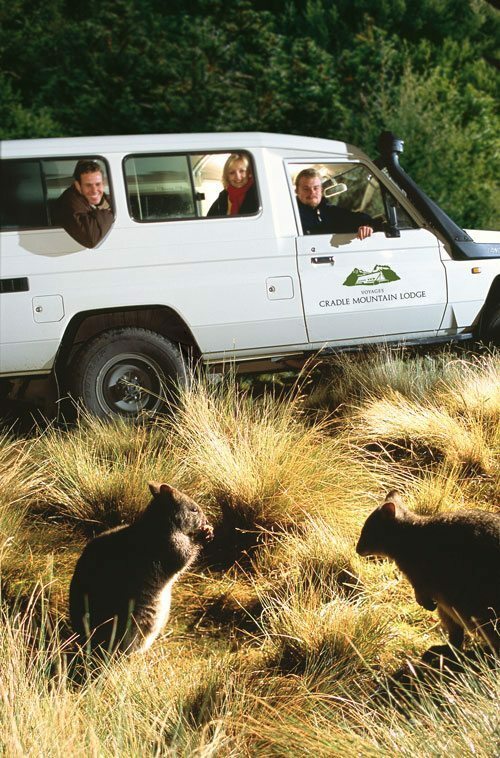 GREAT FOR FAMILIES who want a 4WD adventure holiday with the comforts of a resort facilities including a kids club. 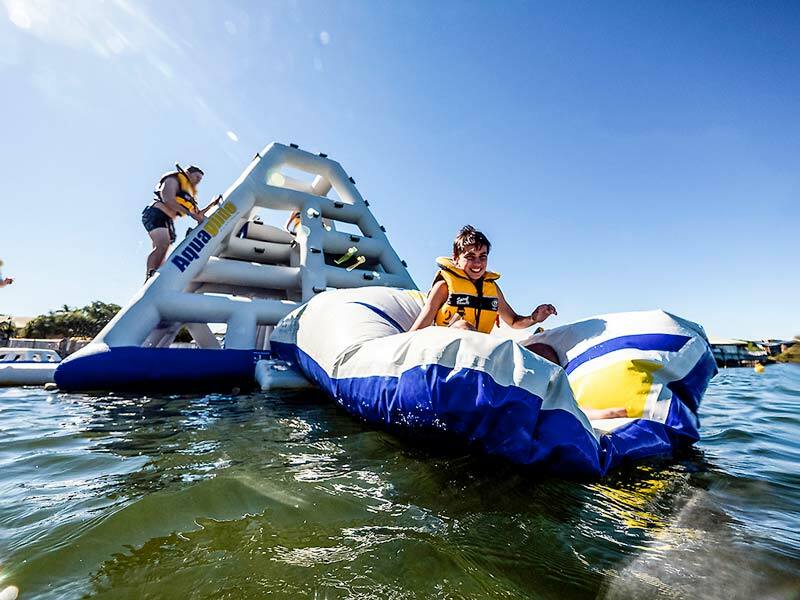 Explore the inland lakes and Fraser Island attractions, swim in the four swimming pools and spas, swing and play in sheltered playground, go fishing along the jetty, watch a sunset on the beach, or become a Junior Eco Ranger where kids spotlight for bats, star gaze, create sand sculptures, canoe and rope climb. Stay in Family Rooms with interconnecting doors or in eco-friendly 1-3 bedroom self-contained villas. 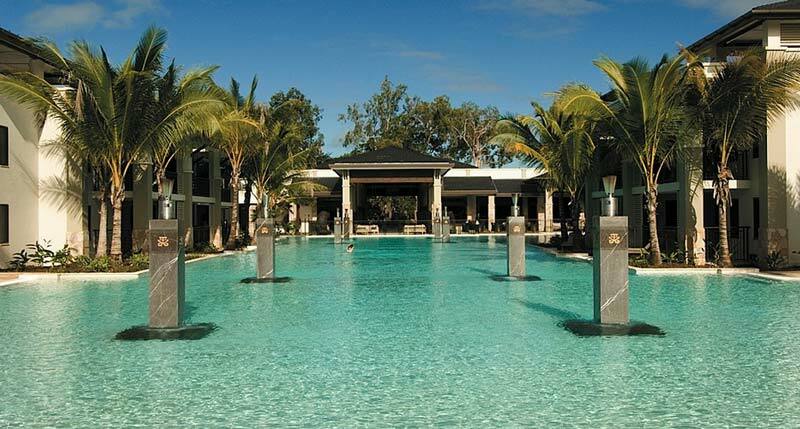 Spacious apartment style villas surround one of the largest lagoon pools in the Southern Hemisphere, some where kids can swim out from their villa terrace at the Pullman Port Douglas Sea Temple Resort. Port Douglas is a great base for families, making day trips to the Great Barrier Reef and the Daintree Rainforest. Across the road from the resort is Four Mile Beach and a short drive to the conveniences of Port Douglas include shops, chemist, cafés and restaurants. 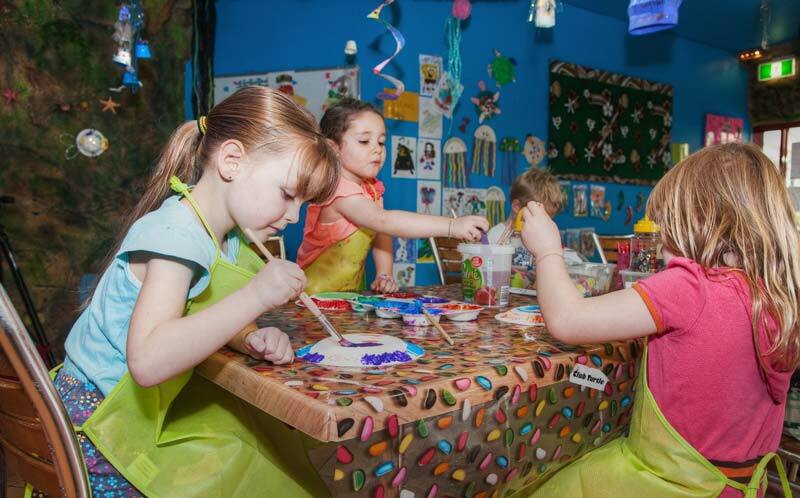 During school holidays, the resort runs a popular Kids Club with arts, crafts, games and organised activities. GREAT FOR FAMILIES who want to splash out on a luxury beachside holiday with the space of an apartment. 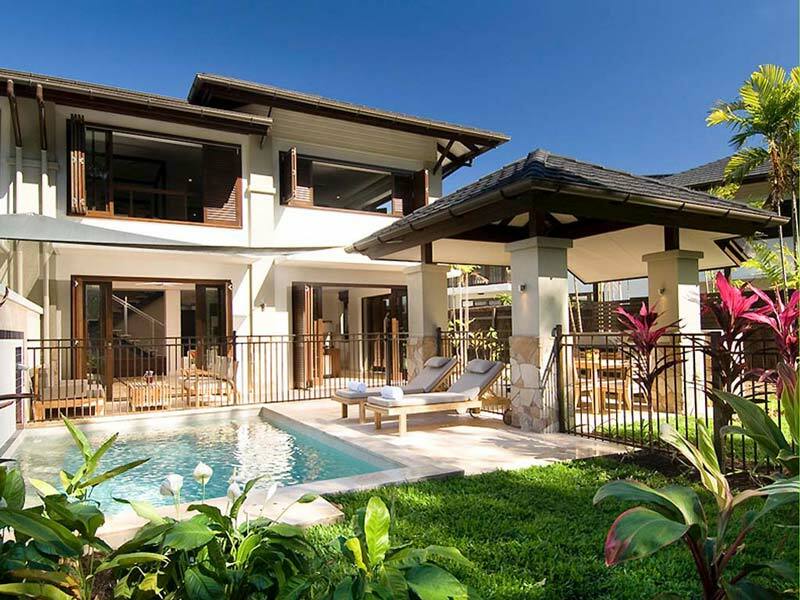 Splurge on a private villa with plunge pool. Image courtesy Accor Hotels. Upgrade to a modern 2 Bedroom Apartment with swim-out terrace to pool. Swim all day at a most inviting lagoon pool. Whilst the kids are Kids Club parents can enjoy the Vie Day Spa, have a hit on the championship golf course adjacent or enjoy the pool bar. 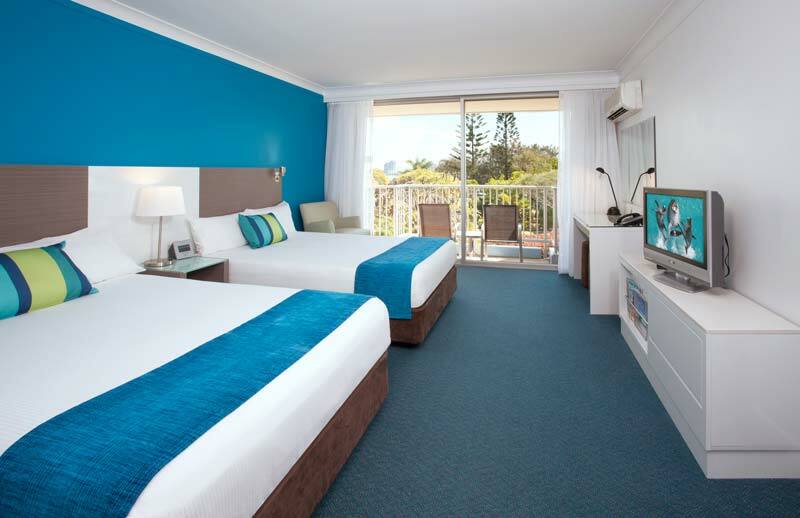 The 4 star Turtle Beach Resort Gold Coast is ideally positioned within a short stroll to Mermaid Beach. Centrally located to Pacific Fair Shopping Centre, Mermaid Waters and Gold Coast attractions. 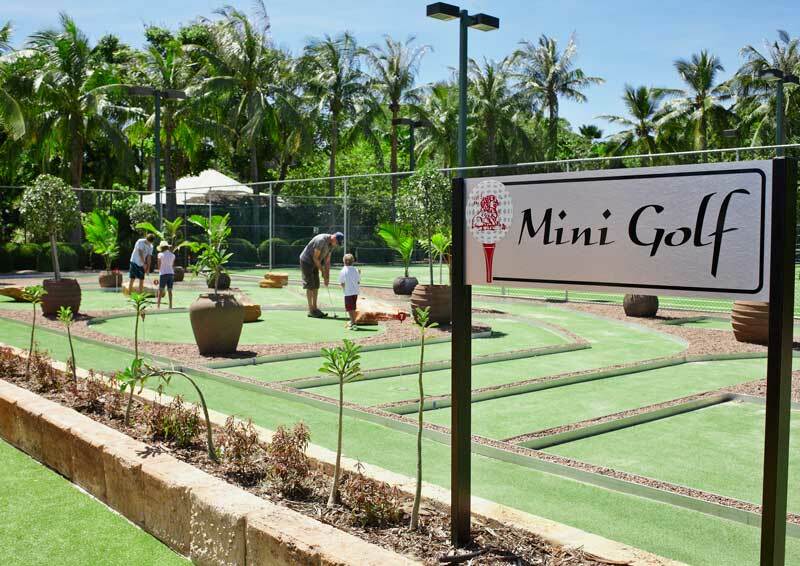 What makes Turtle Beach a winner with families is value for money with plenty of kid facilities including a mini golf course, dedicated cinema and kids splash zone. Perhaps the biggest appeal is the fun filled kids club. Swim in four outdoor heated pools with slides and wading areas, get wet in the dedicated Splash Zone Waterpark, watch a movie in the resort cinema, play at the mini golf course and resort games. Stay in 1-4 bedroom spacious apartments with all the creature comforts of home. 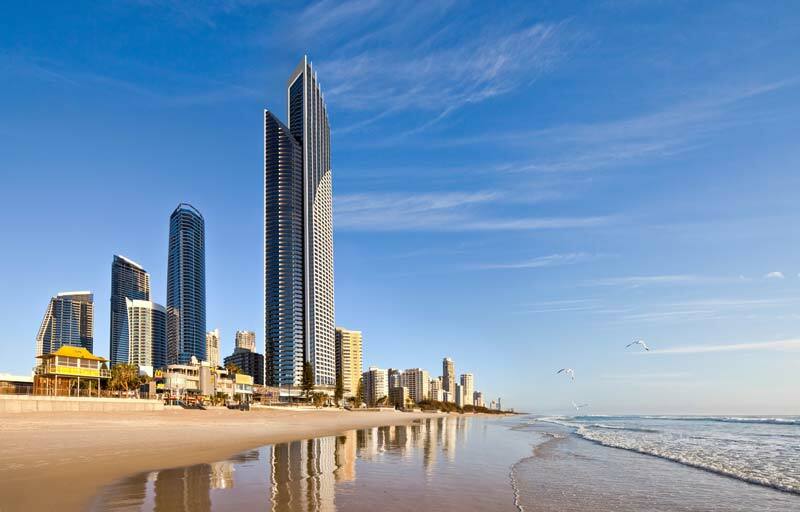 The five star Peppers Soul Surfers Paradise resort stands 77 floors tall towering over Surfers Paradise. 77 floors overlooking Surfers Paradise. Image courtesy Peppers Soul. It’s perfectly located in the heart of Surfers Paradise, moments from retailers, cafes and family friendly restaurants. 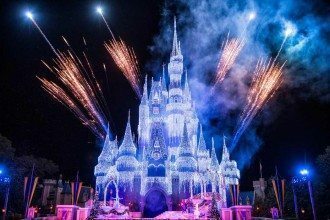 Theme parks and Gold Coast attractions are within easy reach. GREAT FOR FAMILIES who prefer the space of apartments without compromising on five star resort facilities. Luxuriously appointed apartments. Image courtesy Peppers Soul. Swim in an indoor heated lap pool or a very inviting outdoor swimming pool fronting an enviable stretch of Surfers Paradise beach. Stay in luxurious 1-4 bedroom apartments with exquisite ocean views. 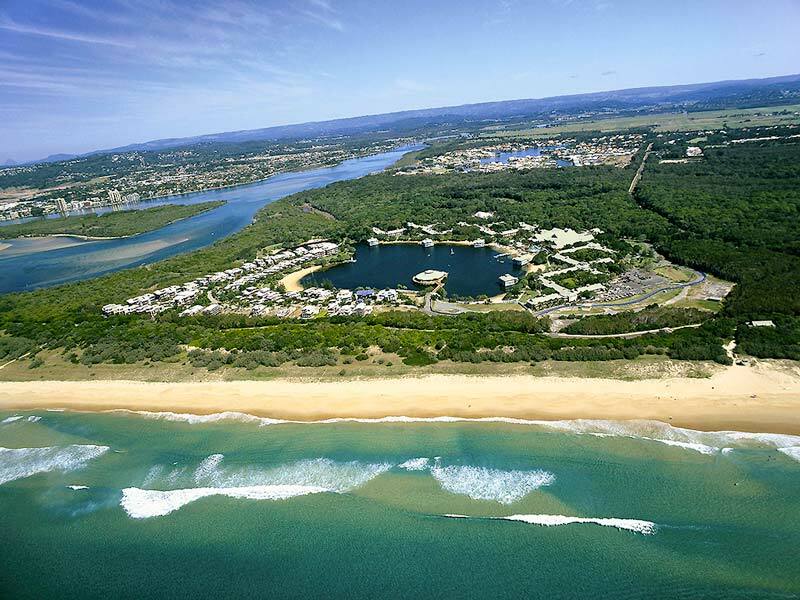 The sprawling 4 star, 36 hectare Novotel Twin Waters Resort has it’s own private stretch of surf beach and boardwalk to access tranquil Maroochy River. Novotel Twin Waters Aerial View. Image Accor Hotels. The resorts remote location means a car comes handy for day tripping the stunning beaches along Sunshine Coast, SeaLife Aquarium, Australia Zoo and Eumundi Markets. 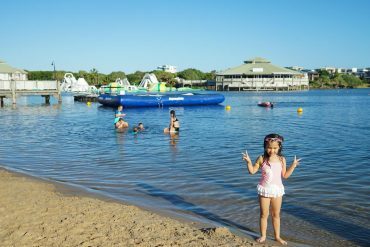 Watersports on the private lagoon, free kids gift on check-in, a dedicated kids club, and a beautiful outdoor pool combined with the “Family & Novotel” promise of value for money and exceptional service, makes this resort one of the best in Australia. GREAT FOR FAMILIES who want to get away from it all with all the comforts of a resort with kids club. Novotel Twin Waters, Water Park fun. Image Accor Hotels. Splash in the pool or spa, lounge on the man-made lagoon, check out the inflatable Water Park, throw a line in, go on a Laser Skirmish, play in the games room or take the canoe on the lagoon. Stay in interconnecting rooms perfect for families, where the second room is charged at 50% of the ‘Best Unrestricted Rate’. Pay little extra for refurbished overwater villas with self-catering facilities. 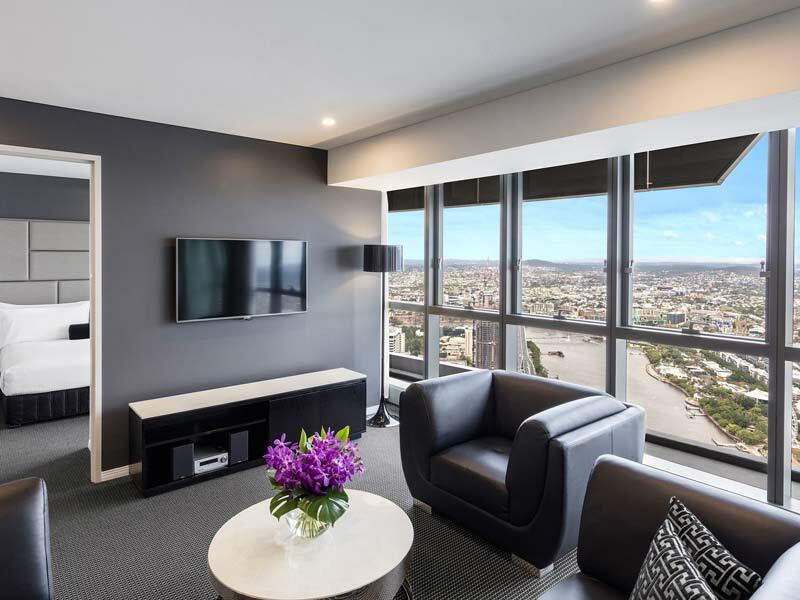 Located on Herschel Street Meriton Serviced Apartments are perfectly positioned to explore Brisbane. Moments from Queen Street Mall, and a short walk over the river to the art precinct of South Bank as well as markets and restaurants. 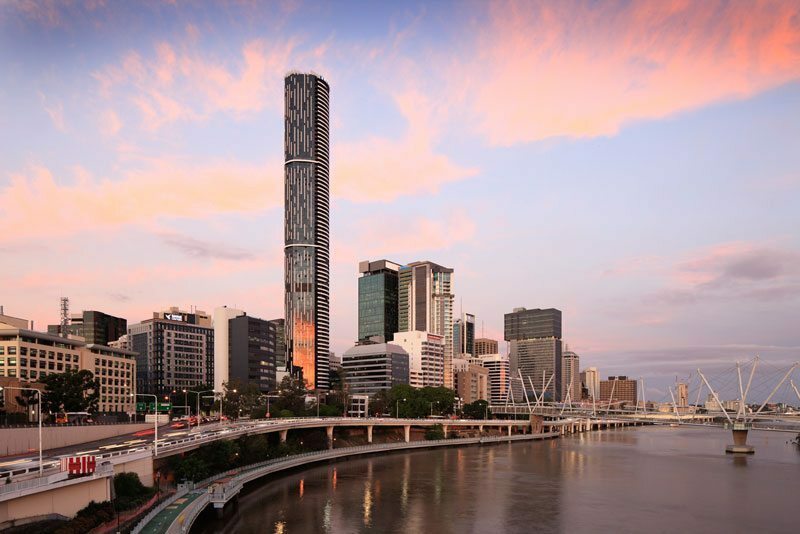 The striking sky high tower overlooking Brisbane River. 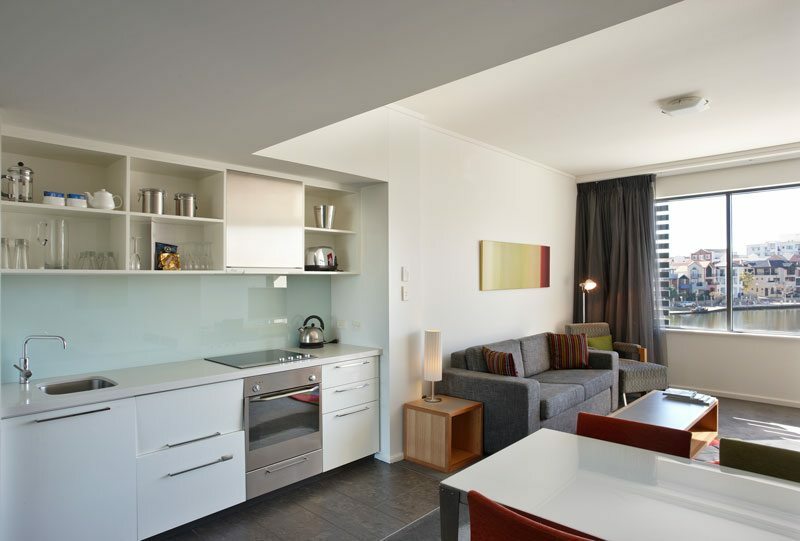 Image: Meriton Service Apartments. Pick up some fresh groceries for the fully equipped kitchen, the Farmers Markets held every Wednesday at Raddcliffe Place or from the city’s supermarkets nearby. 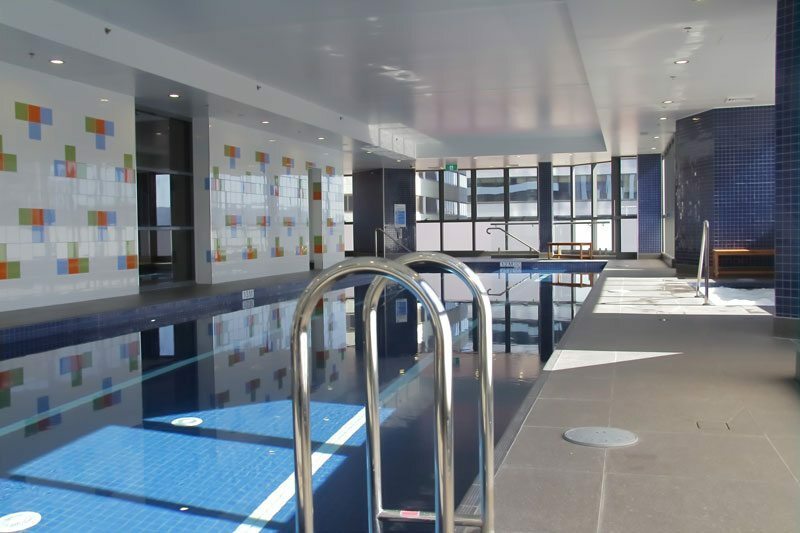 Indoor pool at Meriton Serviced Apartments. 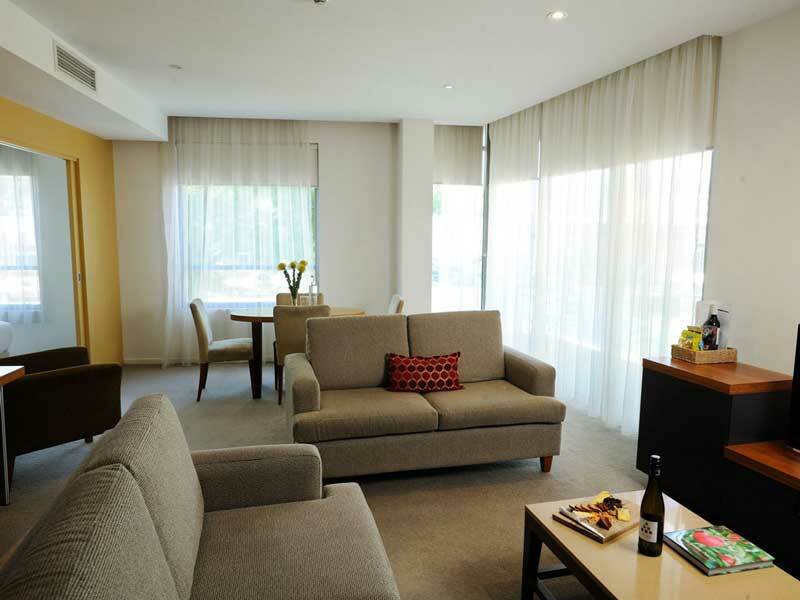 Image Meriton Serviced Apartments. GREAT FOR FAMILIES who a want value for money, central Brisbane city escape, with the comforts of an apartment. 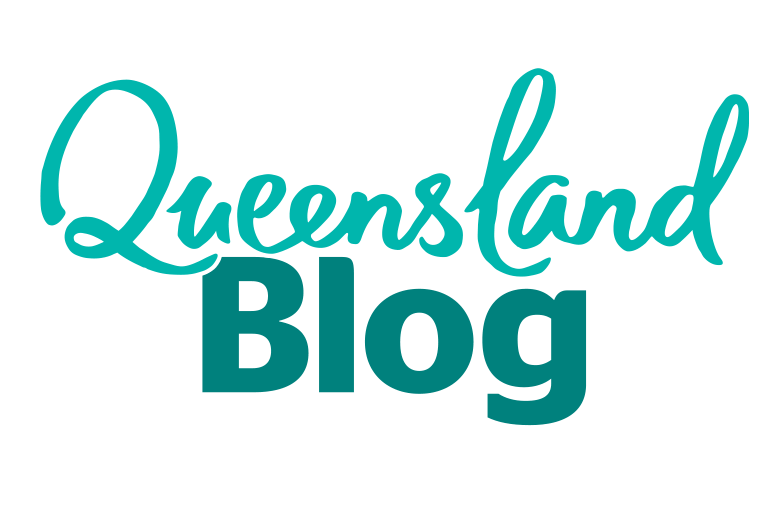 Explore Brisbane city with the kids with GOMA, Science Centre, State Library of Queensland and the man-made lagoon in South Bank a short stroll away. 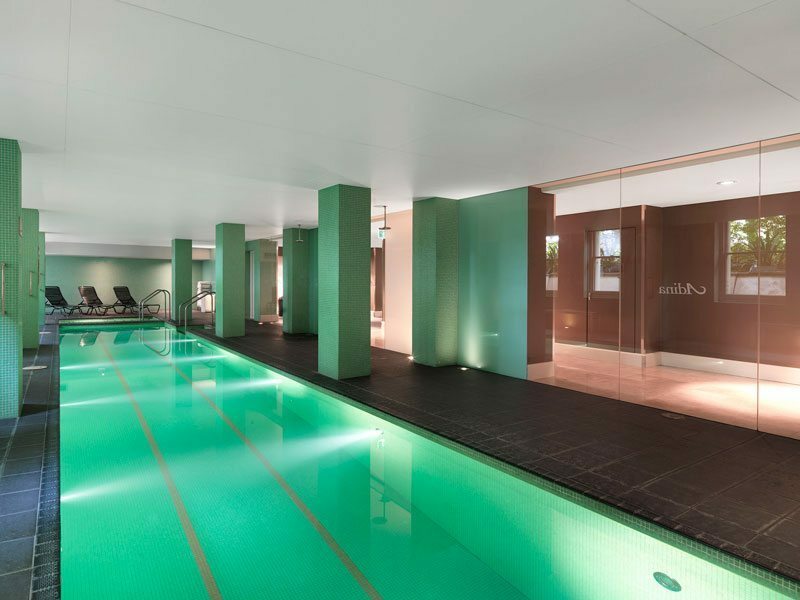 Afterwards, swim in the indoor heated pool before settling to a Foxtel movie. Stay in a contemporary 2 Bedroom Apartment with gourmet kitchen and modern amenities. 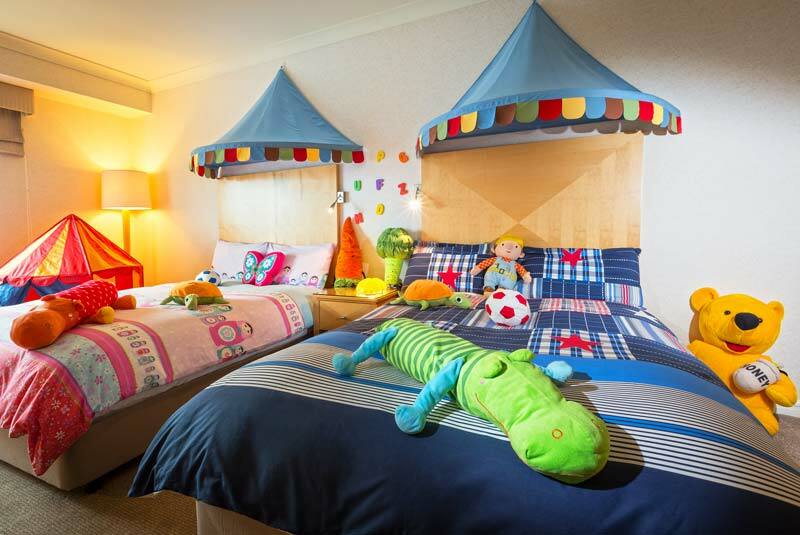 Fairmont Resort Blue Mountains is as much a country retreat for kids as it is for parents. 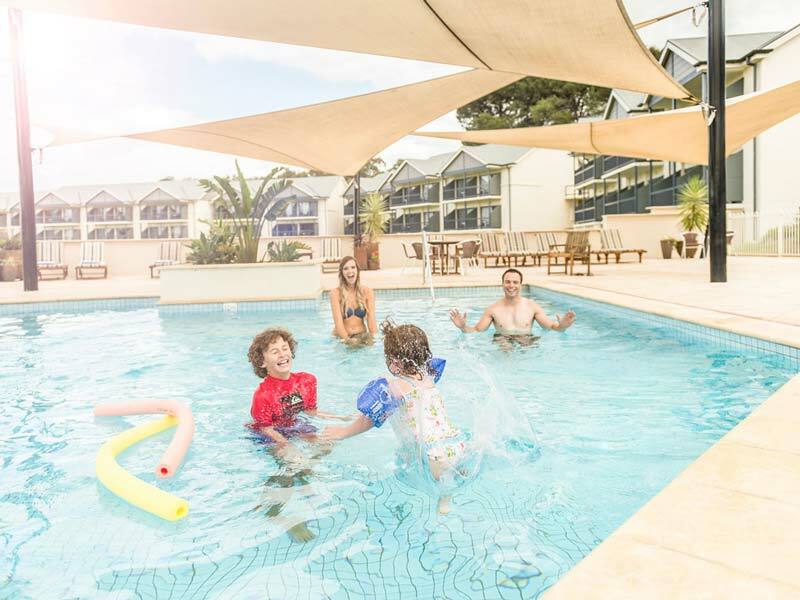 Located in the tranquil surroundings of World Heritage-listed Blue Mountains, kids will forget any existence of a beach, choc full of kid-friendly facilities. 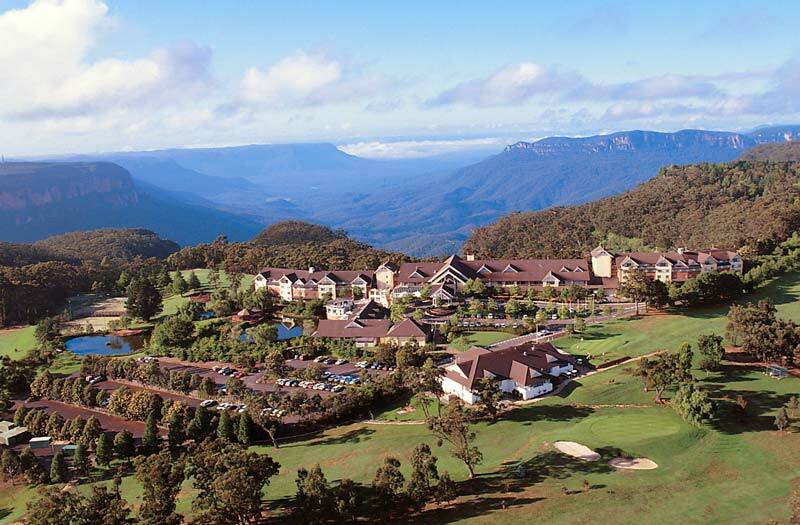 Fairmont Resort Blue Mountains aerial shot. Image courtesy of Fairmont Blue Mountains resort. During the school holidays, a Kids Club program operates so parent’s can indulge in a spa treatment, go for a bushwalk or Segway tour whilst the kids are really having fun. GREAT FOR FAMILIES who want to escape to the Blue Mountains without worrying if there is enough to do for the kids. Bowling alley and games room. Image courtesy Fairmont Resort Blue Mountains. 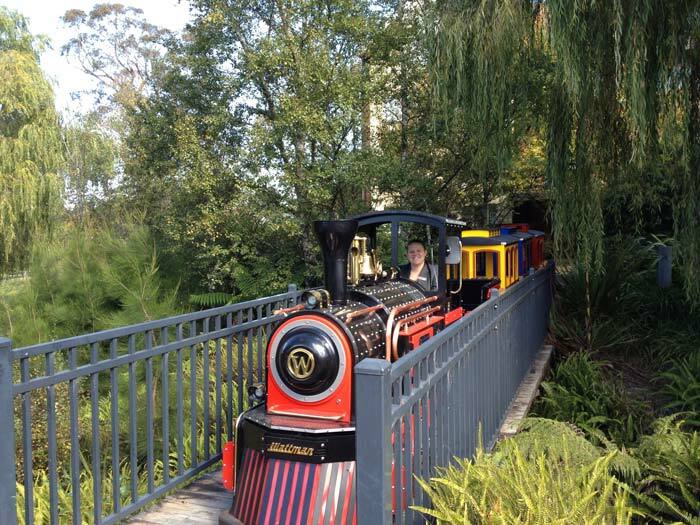 Take a ride on the resorts own miniature train, merry-go-round or go for a drive in the electric cars. Check out the outdoor maze, splash in the indoor and outdoor pools, or play in the Kidszone with a soft play area, pinball, bowling alley and hoops to shoot. All aboard the Fairmont Express. Image: Fairmont Resort Blue Mountains. Stay in the Family Suite with a separate parents room and two single beds in the lounge area. Byron Bay is fast becoming a bit too hipster and expensive for families, Kingscliff maybe a better option with equally pristine beaches and enough space so as not to upset cool young couples sipping flat whites. To get a dose of trendy beach vibes Byron is only a 30 minute drive away or skip it altogether for a nature walk at nearby Mt Warning. GREAT FOR FAMILIES who want a quality family beachside resort holiday on the Tweed Coast with comforts of a spacious apartment. Modern, spacious 1 bedroom spa suite at Peppers Salt Resort & Spa. Image Mantra Group. Swim all day in the huge outdoor heated lagoon pool and spa, play on pristine Salt Beach, go for a bike ride or during school holidays meet new friends at the Kids Club packed with kid-friendly activities. Spacious, modern light and bright 1-3 bedroom apartments some with private non-heated plunge pools and free in-room movies. For families that are not looking for kids clubs or self-catering facilities, the five-star Swissotel Sydney provides families luxurious rooms and executives suites, recently refurbished with a modern Swiss style. Centrally located to Sydney’s best shopping centres, restaurants and city attractions including Darling Harbour, Sydney Opera House, Hyde Park and QVB. GREAT FOR FAMILIES who want great location on a short Sydney city escape. Outdoor heated pool. Image Swissotel Sydney. 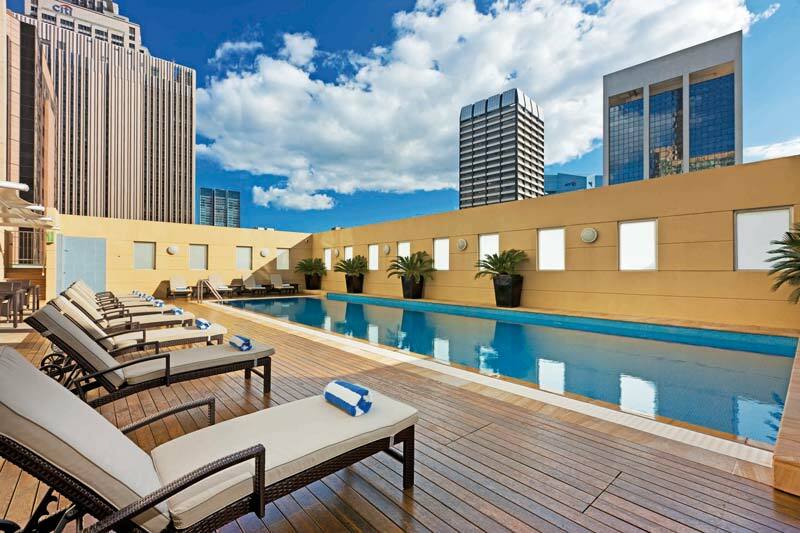 Splash in the outdoor heated pool and Jacuzzi, explore Sydney city, for parents make use of the day spa or have a drink at Crossroads Bar. 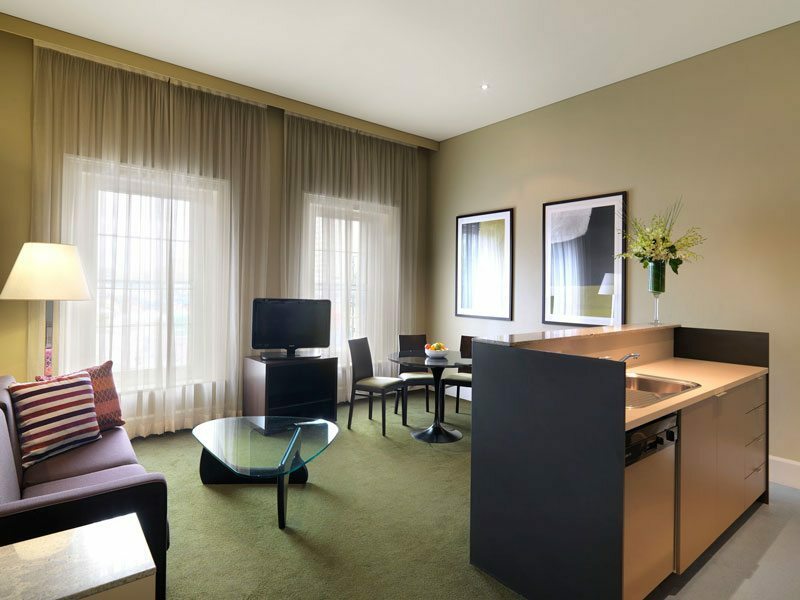 Swissotel’s Family Room features two interconnecting rooms with luxurious fittings. 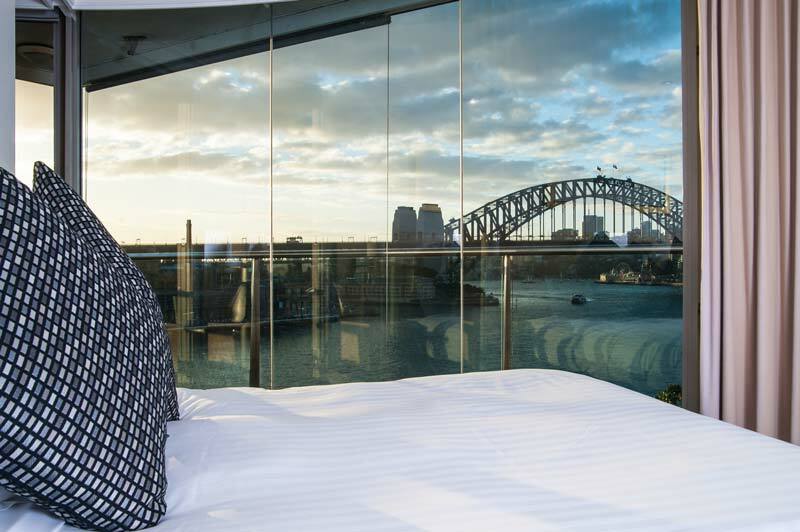 The Pullman Quay Grand Sydney Harbour superbly located on the waters edge, by Circular Quay is moments from Sydney icons including the Opera House, Hyde Park and Sydney Harbour Bridge. Harbour views from your two bed apartment. 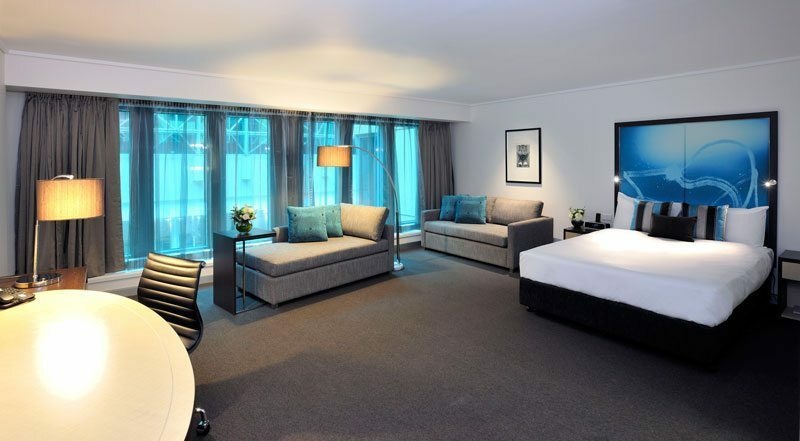 Image courtesy Pullman Grand Quay Sydney. The 5 star hotel offers luxuriously appointed 1-2 bedroom apartments, perfect for families. 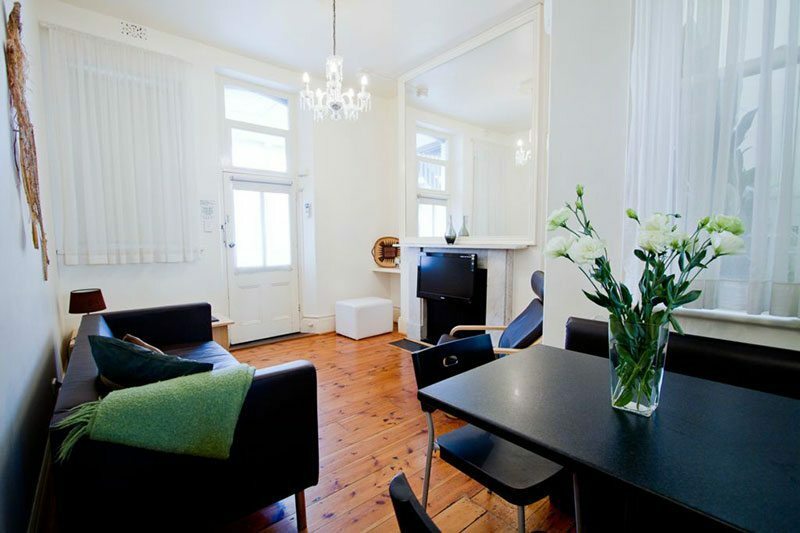 GREAT FOR FAMILIES who want a luxurious Sydney city escape and comforts of an apartment. ECQ Bar. 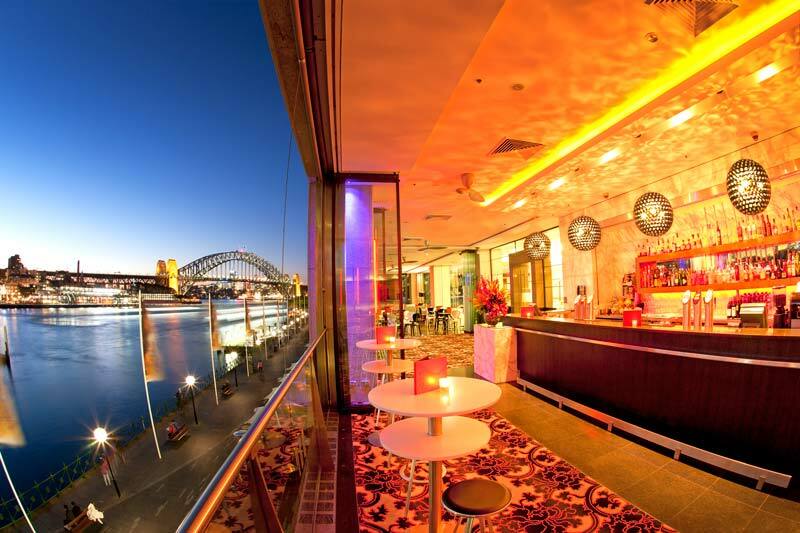 Image courtesy Pullman Quay Grand Sydney. 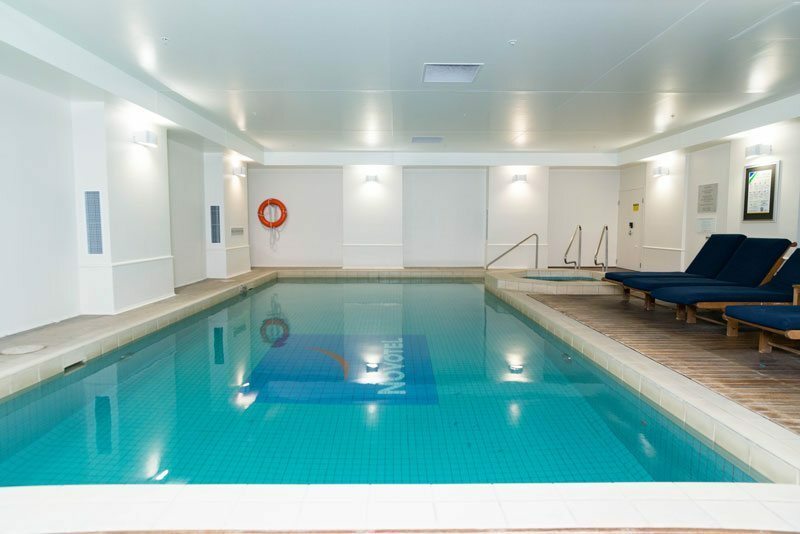 Take a dip in the indoor heated lap pool or spa, check out the harbour views from the elevated recreation deck, for parents grab a drink at award winning ECQ bar or unwind in the sauna. Stay in 1 bedroom fully equipped apartment complete with Nespresso machine, harbour or garden views. 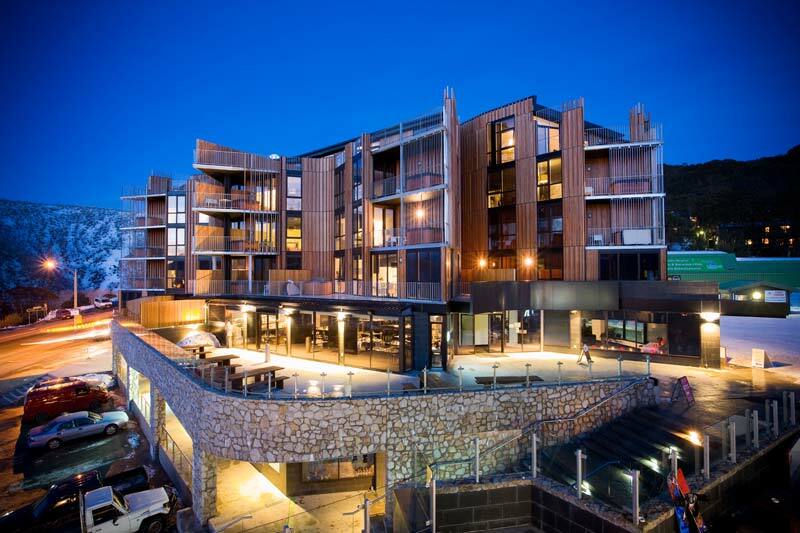 Perisher Valley Hotel is the only hotel that offers guests ski-in and ski-out. The excellent location makes it extremely easy for kids taking ski lessons. The meeting point is directly in front of the hotel and ski lifts. Location is key when skiing with young kids, the need to carry ski gear and walk or wait for transport adds to the stress of snow travel with kids, this location can’t be beat. GREAT FOR FAMILIES on a relaxed family ski holiday, where location is a deal breaker. Drop the kids off downstairs at the Perisher’s kids ski program, catch the flare run each Saturday night from your window, soak in the indoor Jacuzzi, play in the games room, sip a hot chocolate by the fire or catch a free in house movie. Stay in a Family Room which sleeps four with a Queen bed and bunk bed and views of Perisher Valley. The perfect stopover between Sydney and Brisbane and a family holiday hot spot for decades, Coffs is a little tired and so are most of the hotels and resorts. Do not be deterred by some parts of the Nautilus Beachfront Villas and Spa resort facilities. Families will not look back if selecting a shiny sparkling “New executive apartment”. Though the older style 1 and 2 bedroom villas are comfortable enough. Positioned further out of Coffs Harbour, it boasts a beautiful beachfront location and a short drive into town. GREAT FOR FAMILIES who want a Coffs Harbour resort holiday without compromising on quality apartment accommodation. All you need is a pool and there’s two at the Nautilus. Splash in two large outdoor pools, jump in the indoor or outdoor heated spa, play on the resort playground, build sandcastles along the surf beach, go for a bike ride around the resort, have a hit of tennis on the courts or enjoy an beach BBQ. Stay in beautifully appointed 3 Bedroom New executive apartments with all the mod cons. In the Mid-North Coastal town of Port Macquarie, the ocean can be seen glimmering behind tops of tall pines trees, from the apartment balconies of Macquarie Waters Hotel. GREAT FOR FAMILIES who want an affordable family beach holiday without compromising on space and hotel amenities. Swim in the outdoor heated pool and spa, in the summer join the Dive In movie theatre, enjoy the roof top deck and hot tub. Stay in 2 Bedroom Apartments with all the creature comforts of home. 2.5 hours from Sydney, Nelson Bay in Port Stephens is popular holiday by the sea for Sydneysiders. The Mantra Aqua in Nelson Bay provides a great base to explore the calm sheltered beaches a short drive away. 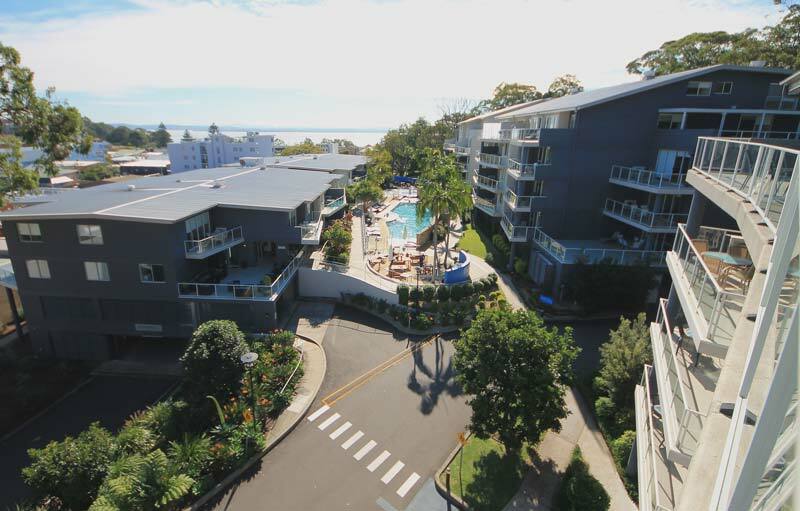 The resort consists of 110 apartments, which surround a lagoon, centrally located in Nelson Bay to local shops and family friendly restaurants. 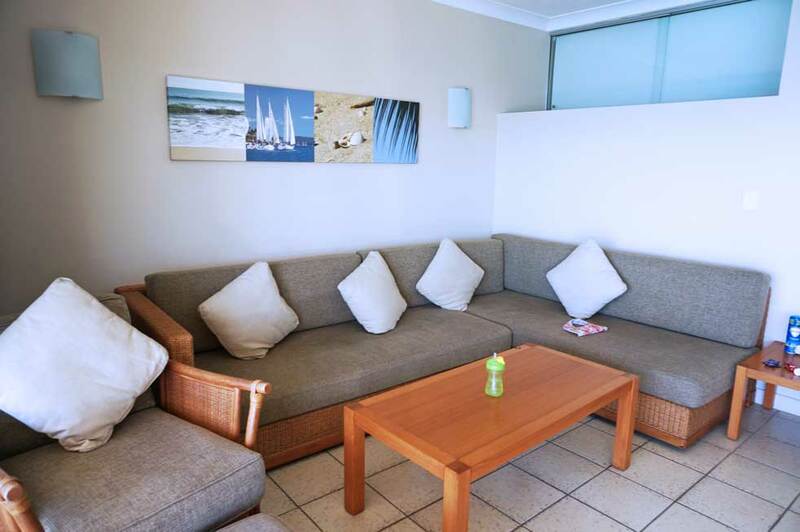 GREAT FOR FAMILIES who want a relaxed beachside resort style holiday in clean modern apartments. Check out the areas natural attractions, go dolphin watching on the bay or zip down a sand dune and return for a swim in the lagoon spa and pool. Water fountains and a small games room is also available. Stay in a 2 bedroom pool view, modern apartment appointed apartment. Too many ski resorts in Australia desperately need a facelift, there’s allot of beige on beige and ruffled valances. Luckily QT Falls Creek have done just that with 1-3 bedroom ‘Apres-ski cool meets designer chic’ quirky QT styled apartments. Think deer wall decals and pops of colour. QT Falls Creek’s location at the base of the main ski run, Wombats Ramble makes everything within easy reach. Kids simply hop on a chair to the top of the run for ski school. Modern and comfortable apartments. Perfect for a family ski holiday. Image QT Falls Creek. GREAT FOR FAMILIES who wants a comfortable family ski holiday at Falls Creek. 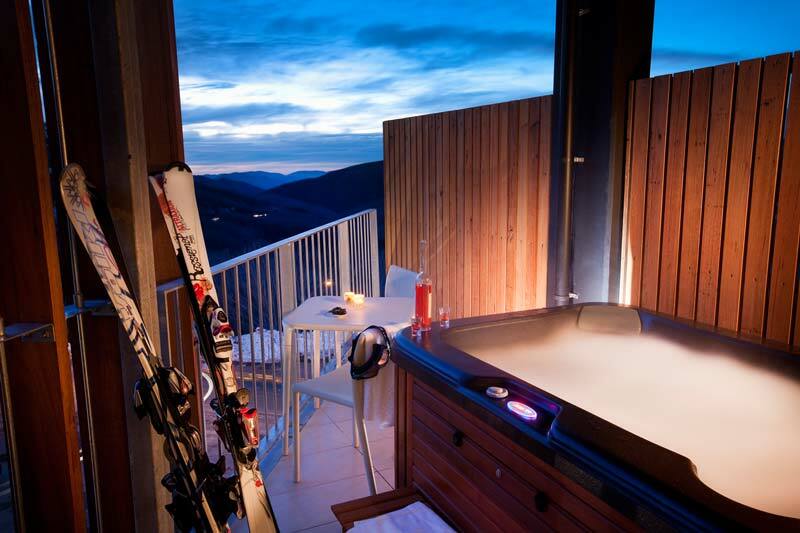 Kids can soak in the hot tub on the apartments private balcony after a day on the slope and feast on good food at the buffet in Bazaar. Enjoy a comfortable family stay in a 2 bedroom apartment with WIFI, entertainment system and pay per view movies. Kids can explore Melbourne’s hidden laneways, sip on babycinos and shop for designer duds, right on the doorstep of 4 star Novotel Melbourne on Collins. The beauty of perfectly positioned hotel is that when kids tire families can pop back for a little rest before tackling Melbourne’s museums and restaurants. It’s close proximity to family friendly and convenient dining means families do not need to spend extra for apartments or self-catering facilities. GREAT FOR FAMILIES who want a short city escape in the heart of Melbourne. A family of 4 can share a standard twin room. Pay a little extra for a Family room, which features a second bedroom, the room features 40” TV, Nespresso Machine and free WIFI. Kids benefit with the ‘Family&Novotel’ promise eat breakfast free, 50% of second room and late 5pm check-out. There’s also an indoor heated pool for kids to splash in. 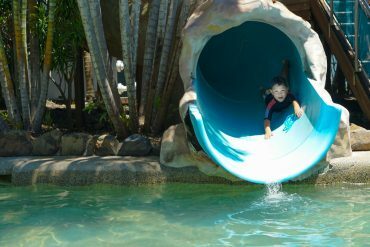 High on the hills above San Remo is the family friendly Silverwater Resort. Offering clean, contemporary 1-3 bedroom apartments, loaded with kid-friendly facilities. Where this resort shines is in it’s quality school holiday kids programs where kids can decorate digeridoos, create cooking masterpieces and handle reptiles. Parents are charged per activity rather than timed sessions. The much-loved Penguin Parade and beautiful natural attractions of Phillip Island is a short drive away. GREAT FOR FAMILIES who want apartment style accommodation and the comfort of kid friendly resort activities when exploring Phillip Island. Inviting outdoor pool, there’s a indoor heated pool for when it gets a touch frosty. 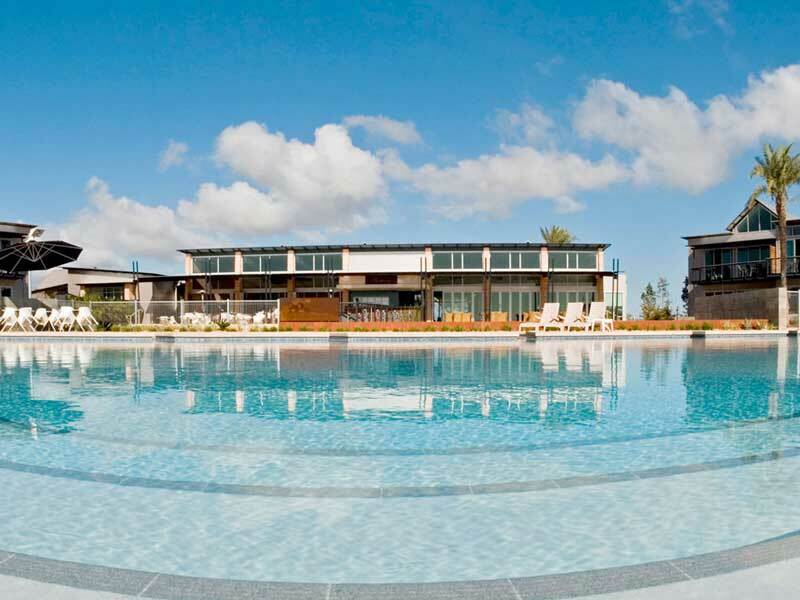 Image Silverwater Resort Phillip Island. 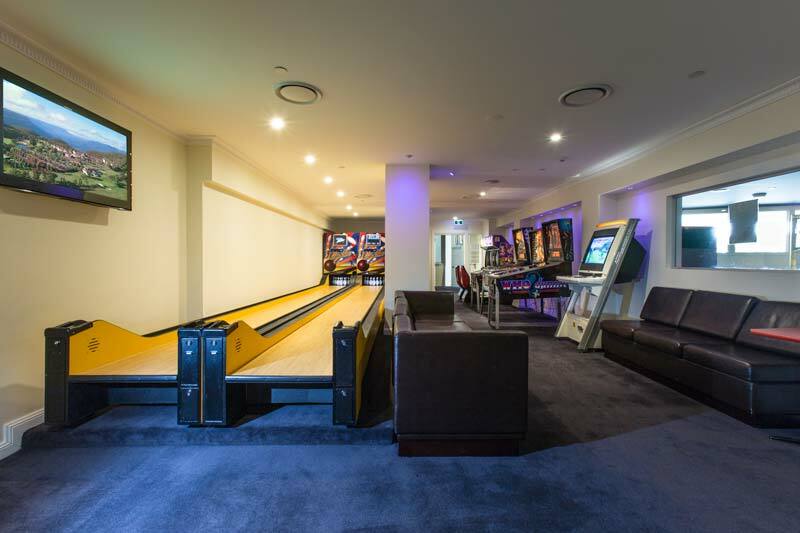 Bounce on several jumping pillows, have a play in the games rooms featuring table tennis and video games, play in the playground or swim in the indoor heated pool. During school holidays, kids can join in on the Kids Holiday Program with qualified carers. Stay in a 2 bedroom, well appointed apartment with mod cons including: gourmet kitchen, widescreen TV and terrace with BBQ. 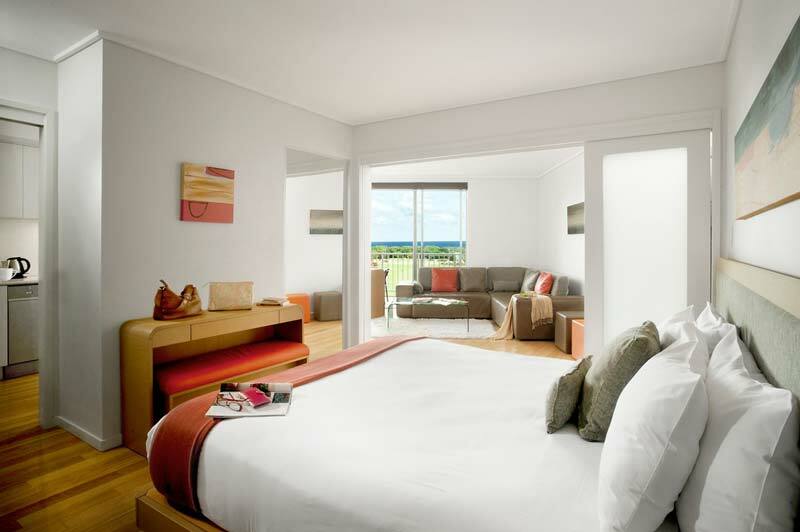 The contemporary designed RACV Torquay Resort sits atop a sprawling golf course and overlooks Torquay and Jan Juc beach. 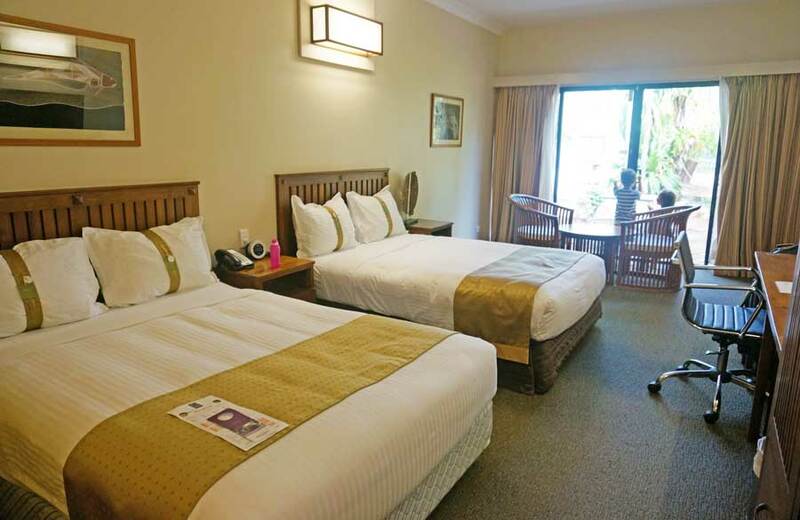 The affordable family friendly resort is superbly located minutes from central Torquay, families have easy access to the nearby beaches, shops, family restaurants and scenic walking trails. 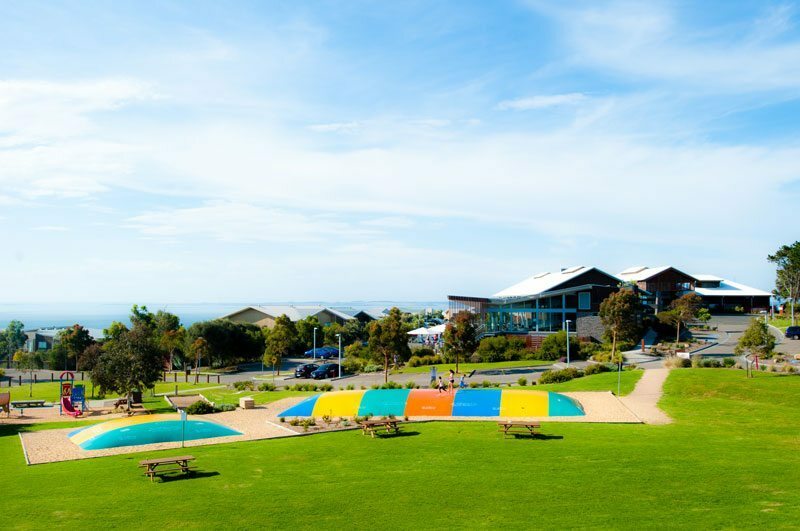 GREAT FOR FAMILIES who want an affordable Torquay beach holiday with all the amenities of a resort including kids club. Bounce on the jumping pillow, dangle from the spider net, play on the playground, check out the games room with Xbox’s, board games and table tennis or take a dip in the nearby indoor aquatic center. During the school holidays kids can meet new friends in the kids program. Parents can spend kid-free time with a round of golf or indulge at the spa. Stay in a family room with an interconnecting door, includes breakfast. 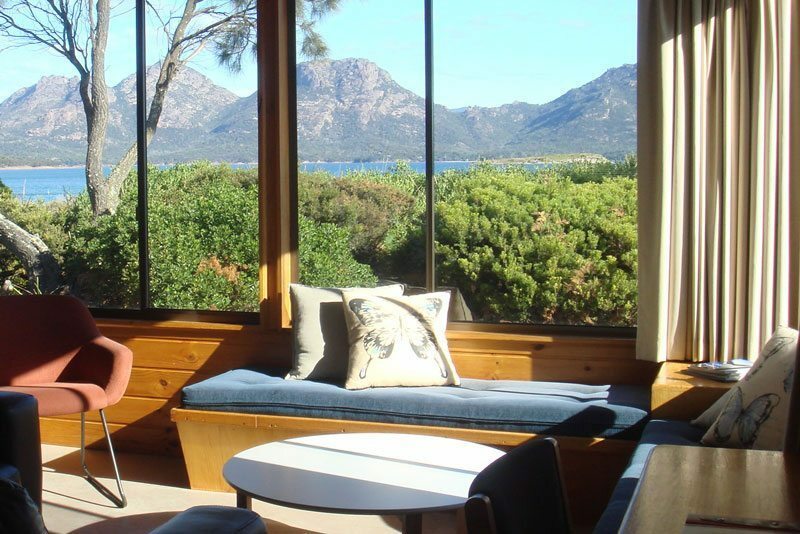 Surrounded by natural beauty the Edge of the Bay Resort offers an affordable getaway to the Freycinet Peninsula. 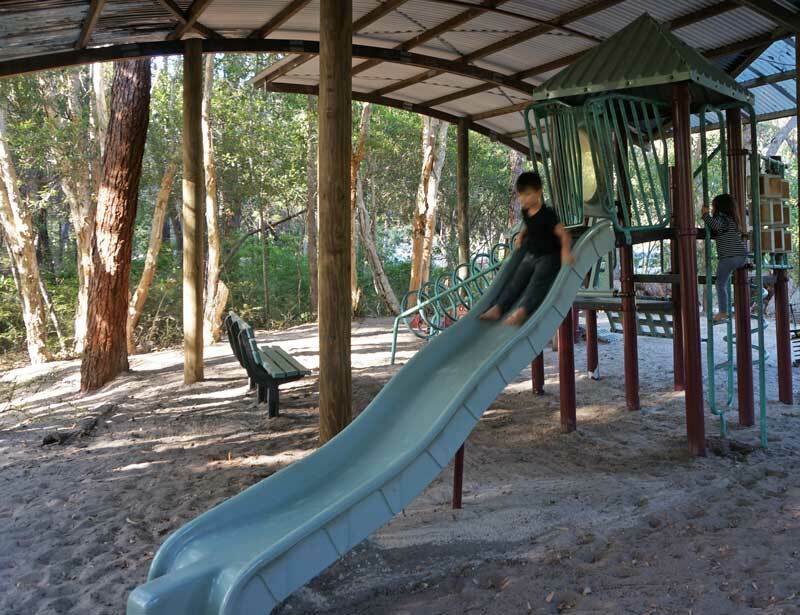 The resorts 27 acres of bushland is set on the shores of tranquil Coles Bay and family friendly 2 bedroom cottages. 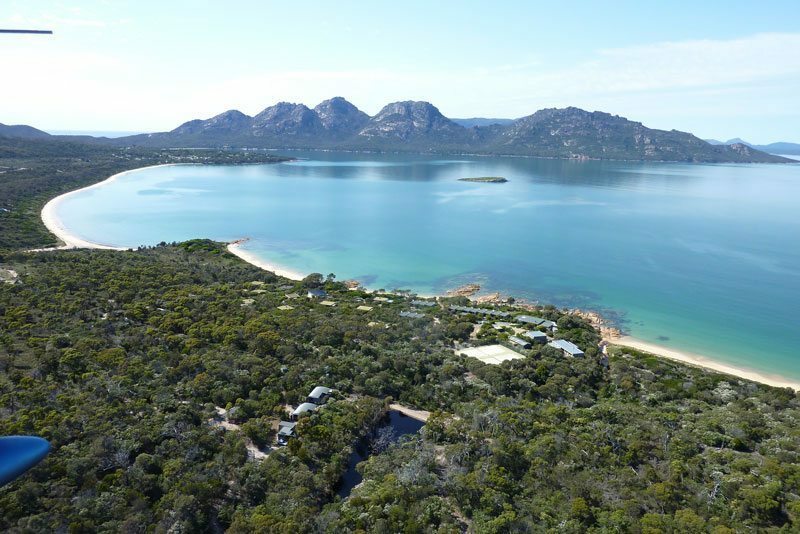 Edge of the Bay Resort offers direct access to 3 private white sandy beaches and Freycinet National Park. There is an plethora of outdoor activities for the family including kayaking, guided or self-guided walks, Wineglass Bay cruise and scenic flight over the Freycinet Peninsula. GREAT FOR FAMILIES who want and adventure holiday in Freycinet with the create comforts of home. Fish from a dinghy on the bay, have a hit of tennis, stroll the foreshore, play on the playground or ride a bike around the tracks. Stay in 2 bedroom secluded cottage offering super views across Great Oyster Bay to the Hazards. Families have a fully equipped kitchen, private BBQ, flat screen TV, heating and A/C and electric blankes. 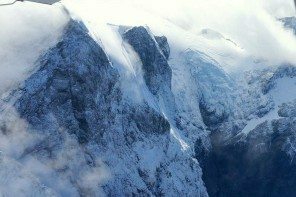 Located on the edge of World Heritage-listed Cradle Mountain-Lake St Clair National Park, the entrance to the National Park lies 100 metres from the lodge. Families can take the walking tracks through landscapes of spectacular alpine forest and pristine wilderness. 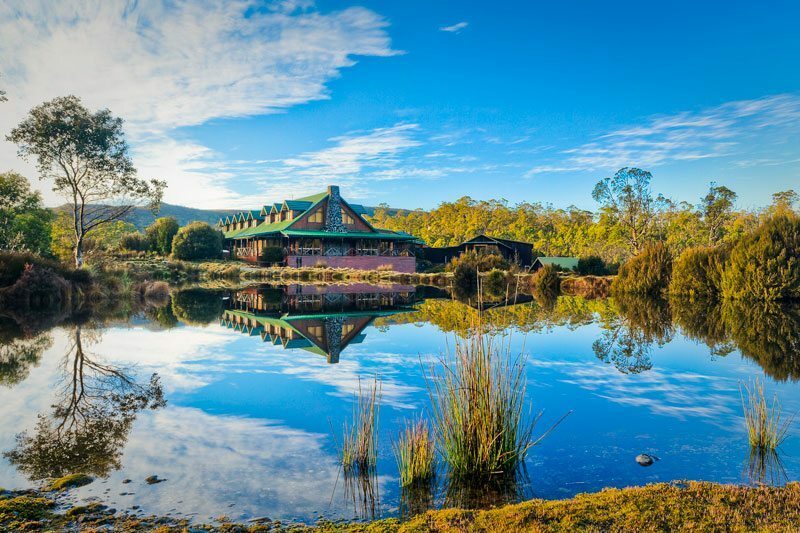 GREAT FOR FAMILIES who want and adventure holiday in one of Tasmania’s premier wilderness regions with luxurious 5 star resort amenities. Go on a native animal night tour, take a guide walk, hire a bike to go mountain riding, go fishing on the lake, paddle a canoe in the summer or toboggan in the winter. Stay in 2 Bedroom Family Pencil Pine cabins with cozy fire heaters in lieu of a TV, be sure to pre-warn the kids. The RACV/RACT Hobart Apartment Hotel is ideally positioned within walking distance to Hobart’s CBD, Salamanca Markets and waterfront. 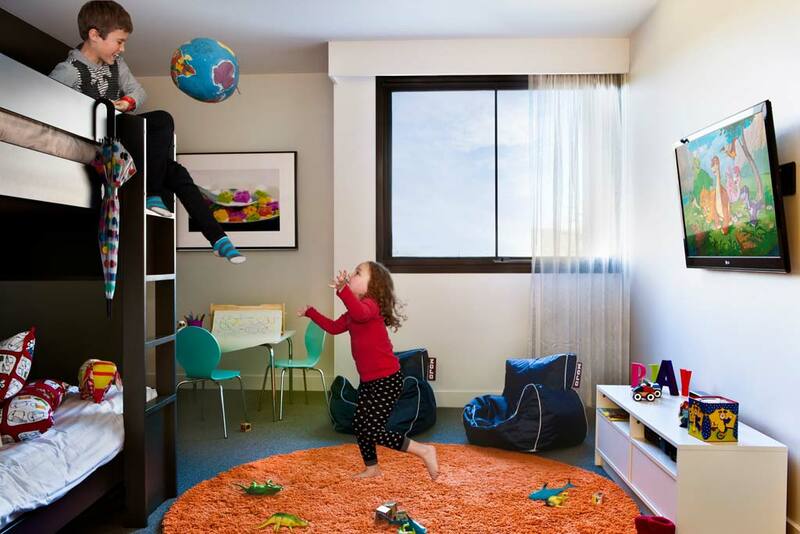 Members receive a further 25% discount off the RACV/RACT Hobart Apartment Hotel published rate, making it more affordable for families looking for a Hobart city escape with kids. 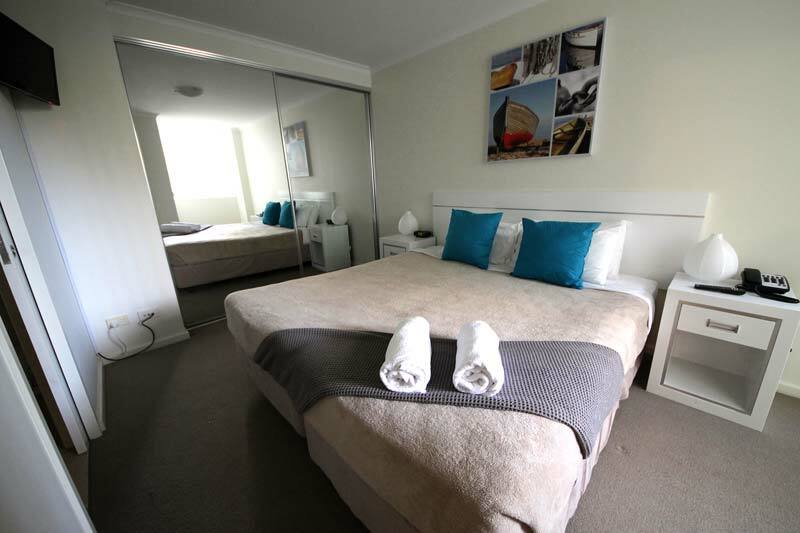 GREAT FOR FAMILIES looking for a short city stay in the heart of Hobart with comfortable hotel facilities. It maybe that Tasmania is too cold, but there is no pool. 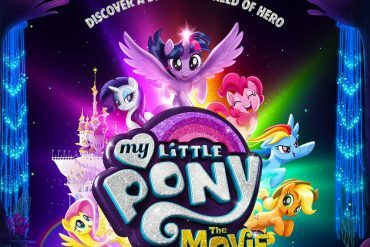 However kids can make use of the in room movies and order for a special kids menu. During school holidays the hotel runs a kids club program so parents can explore the city whilst the kids are safe and having fun. In-room babysitting can also be arranged in the evening. Stay in a clean and modern 2 Bedroom interconnecting Family Rooms with free WIFI, kitchenette, Foxtel and large TV. In a great location within walking distance to cafes, Boags Brewery, the Seaport, City Park and Queen Victoria Museum and Art Gallery (QVMAG). 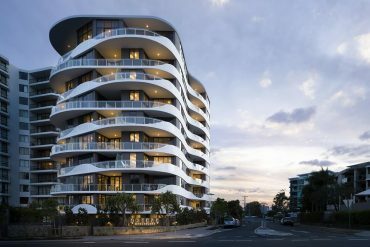 The Sebel Launceston offers 1, 2 and 4 bedroom contemporary apartments. GREAT FOR FAMILIES wanting to explore Launceston and the Tamar Valley region with the comforts of a self-contained apartment. Explore the pretty city of Launceston and the Tamar Valey Winieries, Barnbourgle Links, Hollybank Treetops and take a cruise on the Tamar River. Make the most of the contemporary styled 2 bedroom apartment with full kitchen, laundry and furnished balcony. Positioned perfectly in Rowland Flat, counting the finest wineries in Australia as neighbours. 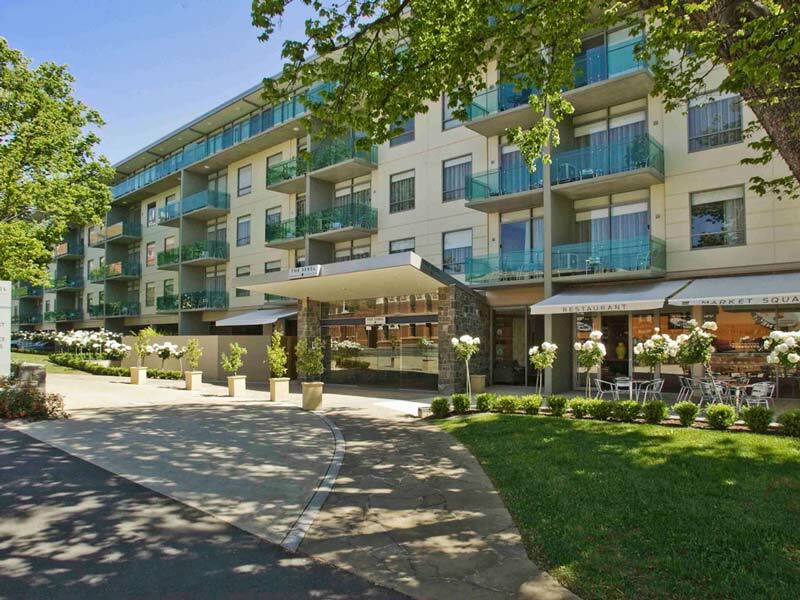 The Novotel Barossa Valley offers the luxuries of a resort combined with the comforts of 2 bedroom apartments. The drawcard for kids is the outdoor heated pool and after dragging them from winery to winery, they deserve to swim in it all day. GREAT FOR FAMILIES wanting to tour Barossa Valley in style with kids. Play chess on a giant chessboard, shoot some hoops, have a hit of tennis, enjoy family friendly Harry’s Restaurant, ride a bike or swim in the heated pool. Stay in light, bright and modern 2 Bedroom Apartments all with balconies and views of the Barossa Valley. Featuring full kitchens, iPod docking station, in-house movies and widescreen TV. 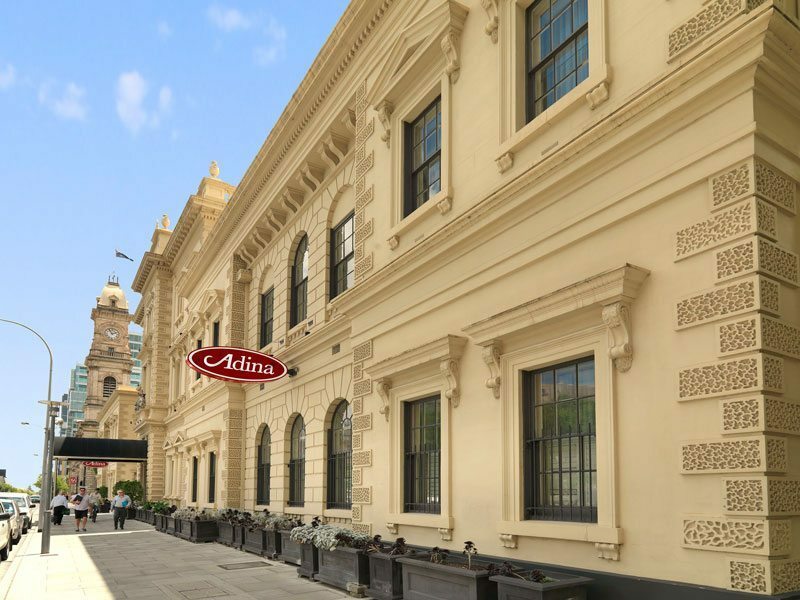 Retaining the historic charm of the heritage-listed treasury building with modern comforts of a hotel, the Adina Apartment Hotel Treasury enjoys excellent location on Victoria Square. Rundle Mall’s shops, city cafes and the Adelaide Central Market are within walking distance, however it’s positioned far enough from the nightlife to provide the kids a night of uninterrupted sleep. Most welcomed is that kids stay free using existing bedding. GREAT FOR FAMILIES wanting an Adelaide city escape without compromising on location, space and conveniences. Not many apartment hotels in central Adelaide offer pools, make good use of the indoor heated pool and Jacuzzi after a day in the city. Stay in a Premier Two Bedroom apartment offering city views, spacious living area, full kitchen, free WIFI, flatscreen TV and kids enjoy toy boxes to borrow from. For parents, there’s a gym and in-room spa services. Modern, polished and well appointed apartments housed in a historic 1889 terrace house, which once was a boys school. The Seawall Apartments are simply charming. Directly across from Glenelg beachfront and a stroll to cafes, shops and transport. 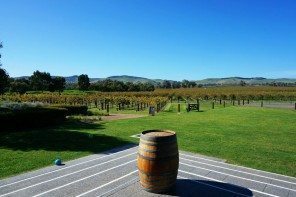 The award-winning boutique hotel provides a great base to laze by the sea or or take short trips to visit the Southern coastline’s Fleurieu Peninsula. 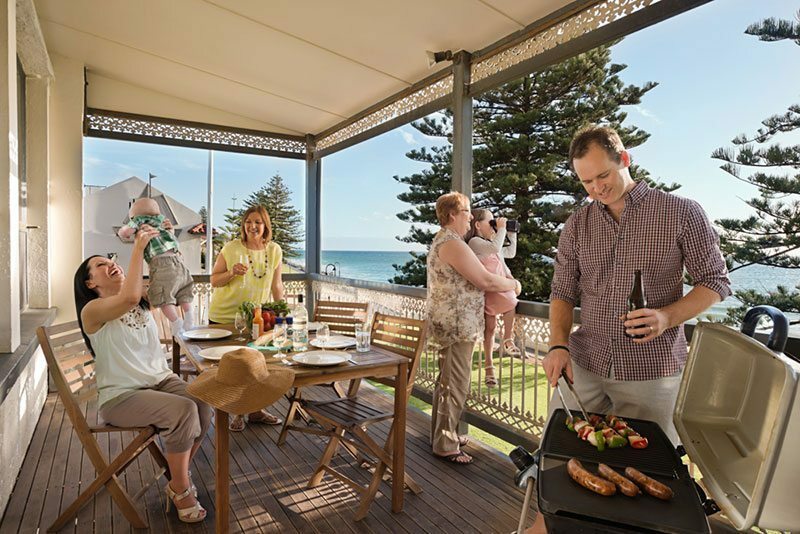 GREAT FOR FAMILIES looking for a charming South Australian seaside holiday in self-contained stylish apartments. 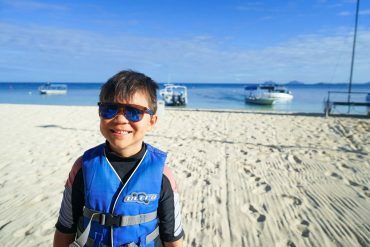 Build sandcastles across the road, watch kids jump off the jetty or check out , sit and eat a gelato or head to The Beach House for a whole day of bumper boats, waterslides, carousels and dogem cars. Stay in beautifully appointed 2 Bedroom Seafront Family Apartments featuring a private balcony or deck for the beach sunsets. Kids blowing bubbles with new friends on the sand bluff overlooking Cable Beach as a silhouetted camel train ambles across hues of gold and amber. Families never tire of the Indian Ocean sunsets and there’s no other place to stay, than right on Cable Beach at Cable Beach Club Resort & Spa. Cable Beach Club Resort & Spa fronts the most sought after spot for sunset, whilst other families are scrambling for a car park, all guests have to do is casually stroll with picnic in hand across the road to view the iconic sight. You don’t even have to leave the resort, the famous Sunset Bar and Grill is a popular spot for sundowners and a bite to eat. 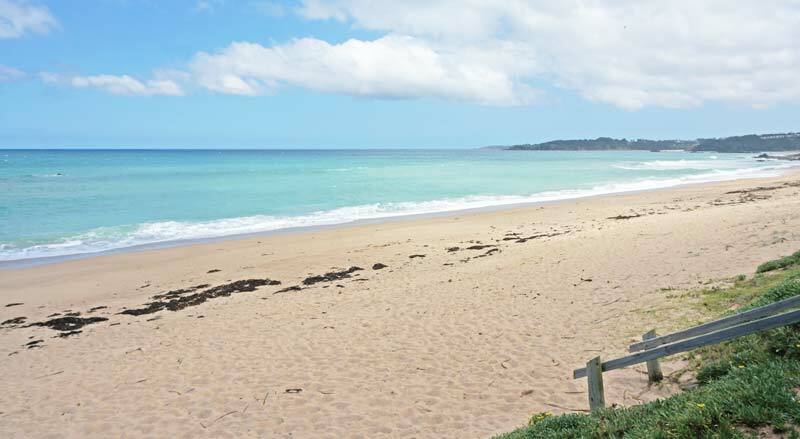 GREAT FOR FAMILIES looking for a relaxed resort holiday at one of Australia’s most beautiful beaches. 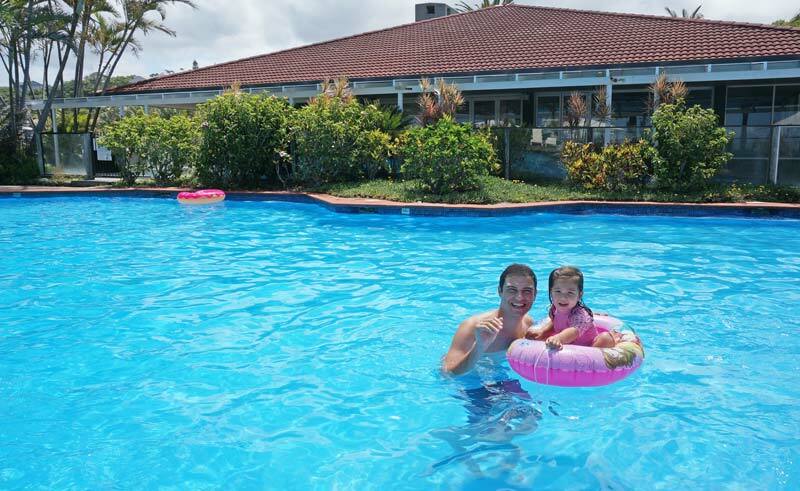 Swim in the dedicated family pool, get drenched under water buckets and jets at the resort’s water park, have play in the shaded playground, take a putt in the mini-golf course, enjoy the h games pavilion or join in on the weekly kids activity program. Stay in a colonial and Asian fusion inspired Pearlers Bungalow with full kitchen minus microwave, 2 bedrooms, 2 bathrooms and Foxtel TV. Usually city location is everything, however in Perth with it’s various neighbourhoods lends itself to staying outside of the CBD with everything easily accessible by car. 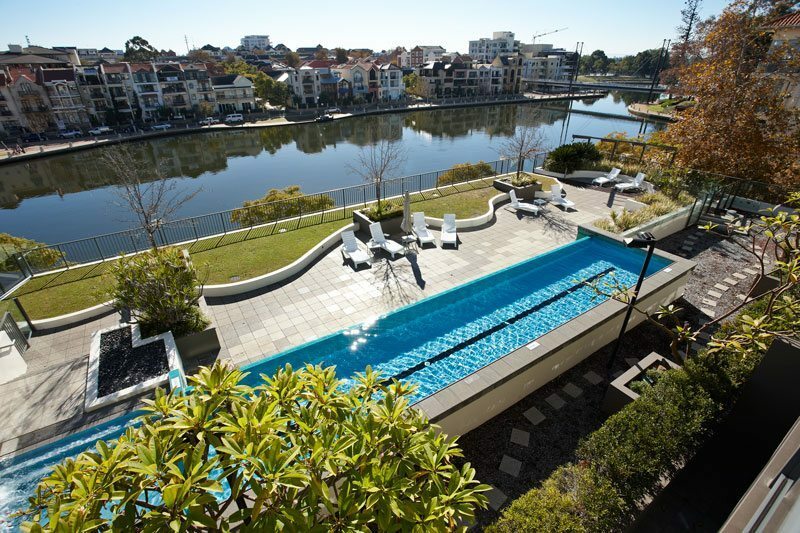 The Sebel East Perth offers modern 1-3 bedroom apartments overlooking Claisebrook Cove and Swan River. It’s located within close proximity of attractions, 2.5km or 6 minute to the state library, museum and art gallery and 7km to Perth Zoo. East Perth offers shops, trendy restaurants and cafes with all the amenities a family needs for a relaxing escape to Perth. 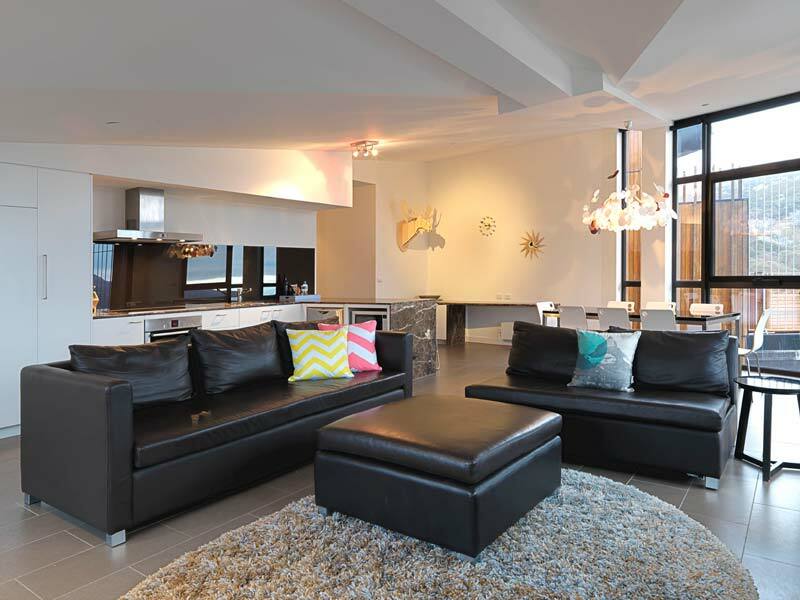 GREAT FOR FAMILIES looking for Perth city break in quality serviced apartments. Swim in the outdoor heated swimming pool, explore the river boardwalks, check out the popular Botanic gardens, Kings Park, WACA Cricket Ground or Swan Bell Tower. 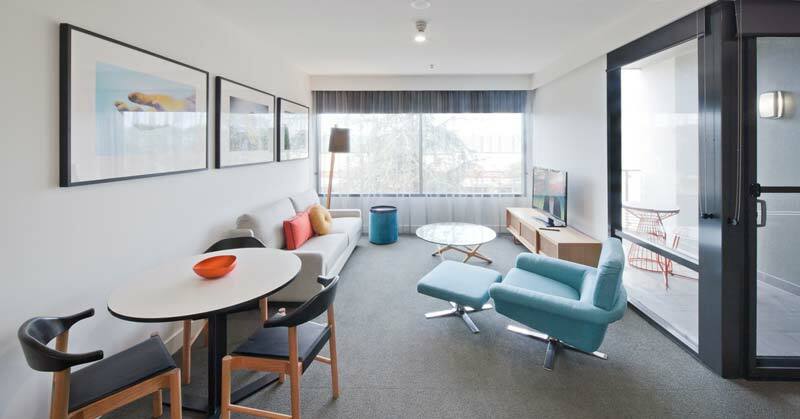 Stay in 2 bedroom sleek and modern apartments with separate living, kitchenette, Foxtel, TV, and laundry facilities. Enjoy complimentary WIFI in the hotel. Aqua Resort offers beach front access to stunning Geographe Bay and luxuriously appointed 1-5 bedroom accommodation on the 8.5 acre property. Family supplies can be picked up from the charming beachside town of Busselton, five minute drive away. 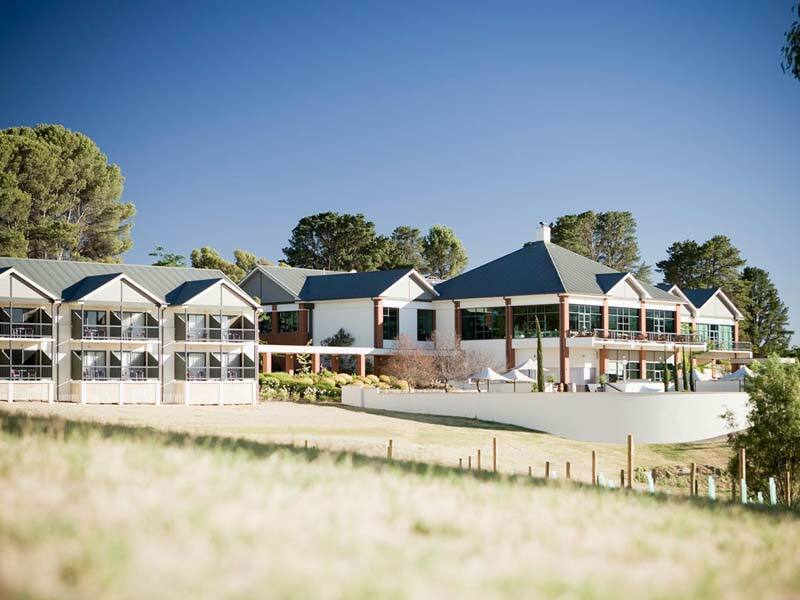 It’s also an easy drive to the the world class Margaret River food and wineries. GREAT FOR FAMILIES looking for a luxury beachside holiday with close proximity to Margaret River. Spot resident possums at night, have a hit of tennis, play on the shores of calm Georgraphe Bay and swim all day in the infinity pool or heated spa. For parents, there is a spa, gym and sauna. Stay in a spacious 2 Bedroom Apartment with private plunge pool. Featuring gourmet kitchen, alfresco with BBQ, large TV, iPod dock and Foxtel. 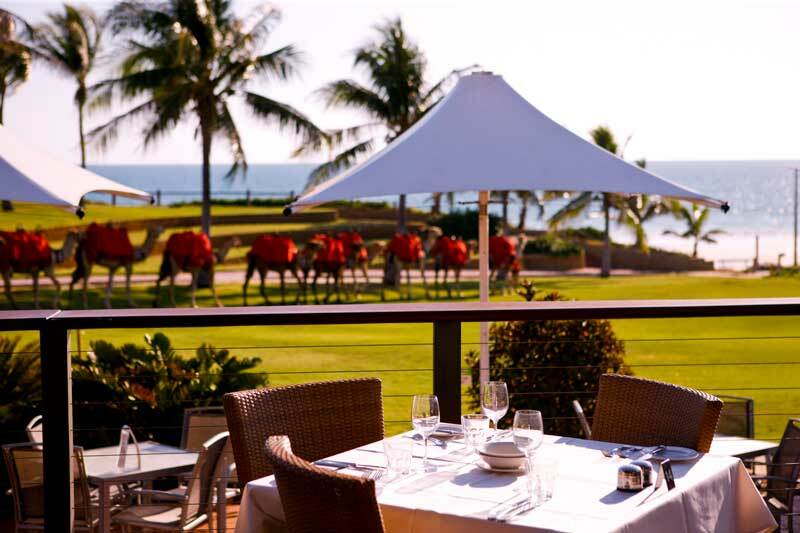 Exmouth is the gateway to world heritage-listed Ningaloo Reef and the 4.5 star Novotel Ningaloo Resort the most luxurious resort in Exmouth. The resort is very comfortable base to explore the areas beautiful attractions including the stunning beaches like Turquoise Bay, magnificent vistas in Cape Range National Park but perhaps the best of all is swimming with the whale sharks. In April-July the clear blue waters of Ningaloo Reef, play host to whale sharks and guest of all ages, including kids can swim alongside these majestic giants. GREAT FOR FAMILIES on an adventure holiday with a touch of luxury in Exmouth. Swim in the large resort pool, when kids get too take them the shaded kids pool, jump in the spa or play on the beach. Nearby adventures include snorkelling, mini golf, kayaking, horse riding or visiting the Jurabi Turtle Centre. Stay in 2 Bedroom apartments with separate open plan living, full kitchen, A/C, TV, DVD and Foxtel. 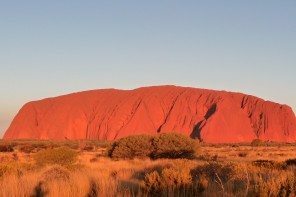 Take the kids out on an early morning Uluru sunrise, trek through the Valley of the Winds at Kata Tjuta and watch the kids play in the red dirt whilst The Rock changes shades of red and purple during sunset. 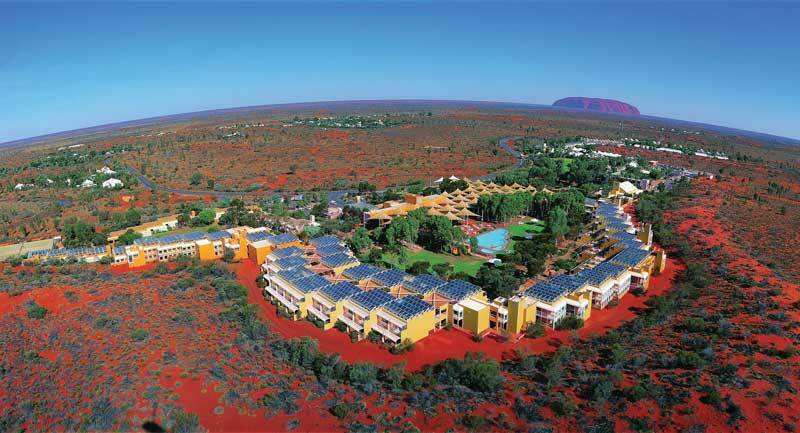 Stay at Ayers Rock Resort’s Emu Walk Apartments when visiting Uluru. Image courtesy Voyages. As wonderful as it is to explore the Red Centre with children, dinning out is often costly and futile with tired young kids. 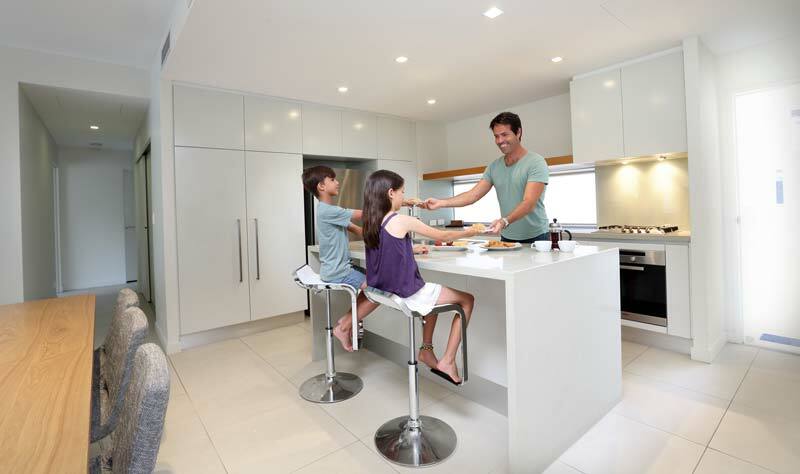 The newly renovated Emu Walk Apartments in the Ayers Rock Resort is the ideal choice for families. With luxurious new Indigenous inspired furnishings, families feel right at home after a day of outback adventure. Self-catering and space is key to content kids and the apartments are moments away from supplies and amenities in the Resort Town Square. GREAT FOR FAMILIES who want to explore Uluru in comfort and style. Swim in one of four swimming pools, play in the resort playground, have a game of giant chess or hit of tennis after a big day out in Uluru National Park. Take a guided garden walk, learn about weapons or bush tucker or enjoy the Indigenous performances where confident kids can volunteer their best emu dancing skills. There are not many animal shaped buildings in the world and the Mercure Kakadu Crocodile Hotel remains one of the only zoomorphic buildings that you can stay in. 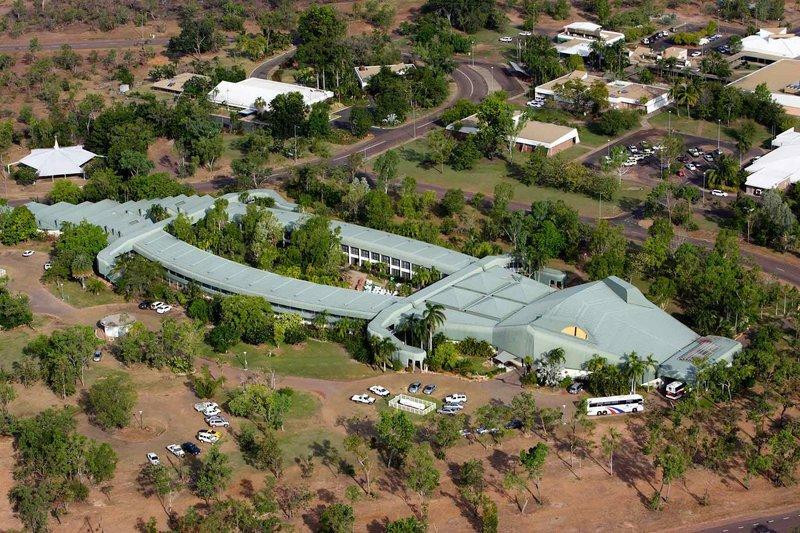 Mercure Kakadu Crocodile Hotel from the air. Image courtesy Kakadu Tourism. Whilst a hotel in the shape of a crocodile may not be everyone’s family travel style, kids will get a kick out of staying in the belly of a crocodile. It’s also the only 4 star resort in Jabiru. Centrally located in Kakadu National Park to Ubirr, Norlangie, Mamukala Wetlands and Cahills Crossing. GREAT FOR FAMILIES who want an adventure holiday in Kakadu but also comfortable resort accommodation and facilities. In the middle of the crocodile lies and outdoor pool, inviting kids to swim after a day of climbing rocks, cruising billabongs and spotting Aboriginal art. Stay in a twin hotel room and enjoy the A/C, flat screen TV and on-demand movies. In collaboration with Accor Hotels. 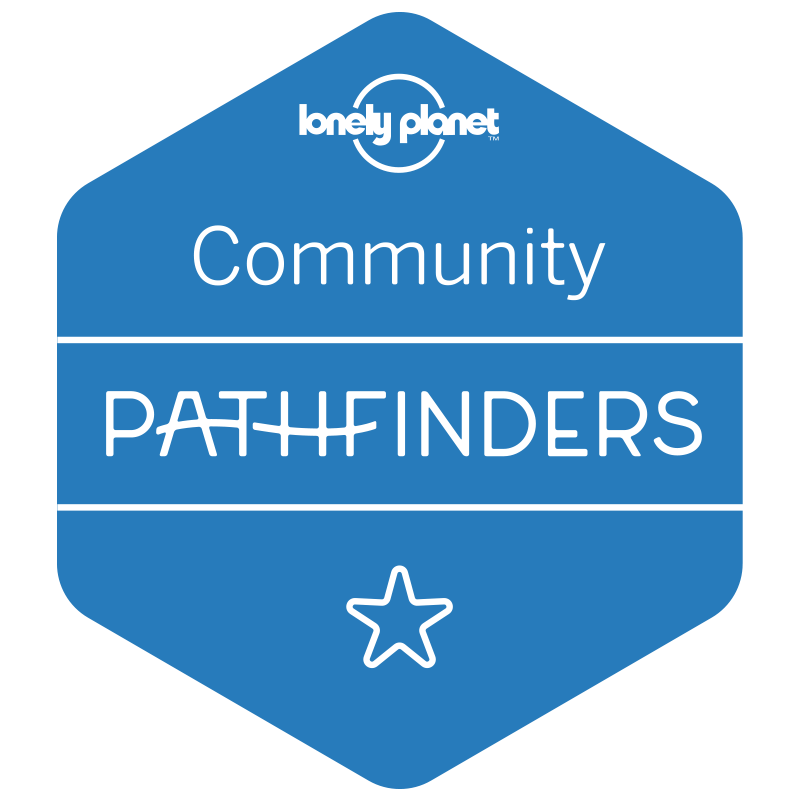 All opinions our very own without bias or influence when compiling the 35 best family accommodation hotels and resort in Australia. What a huge effort to come out with such a long list! I am definitely bookmarking this page as there are few very interesting recommendations even for adult like me;). Lots of great options there! We stayed at the Crocodile Hotel on our last trip to Kakadu. It was great…and after full days hiking and sight-seeing, the beds were very comfy! What an amazing list!! I loved the East Hotel in Canberra. Badly want to try the One&Only.